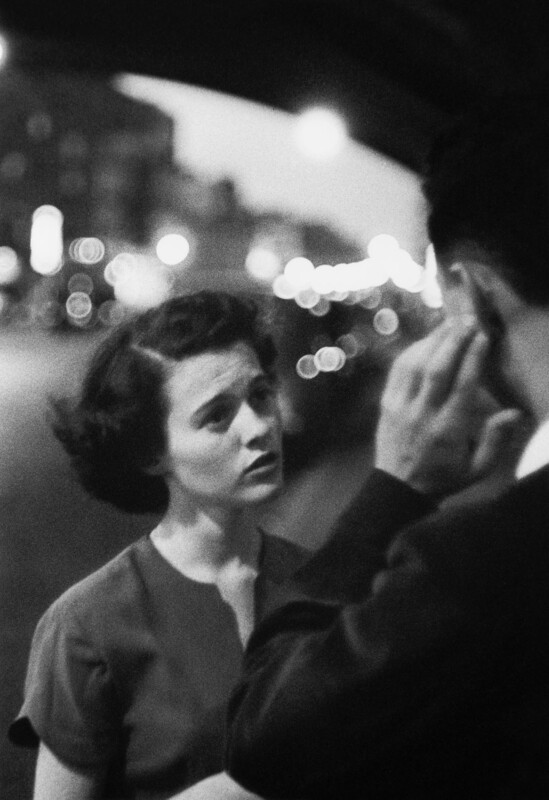 Curator: The exhibition has been curated and organized by Agnès Sire, director of the Fondation Henri Cartier-Bresson in association with the Estate of Louis Faurer in New York, Howard Greenberg Gallery in New York and Deborah Bell Photographs. Life, love and loneliness in the big smoke. Home of the brave, land of the fractured and destitute. 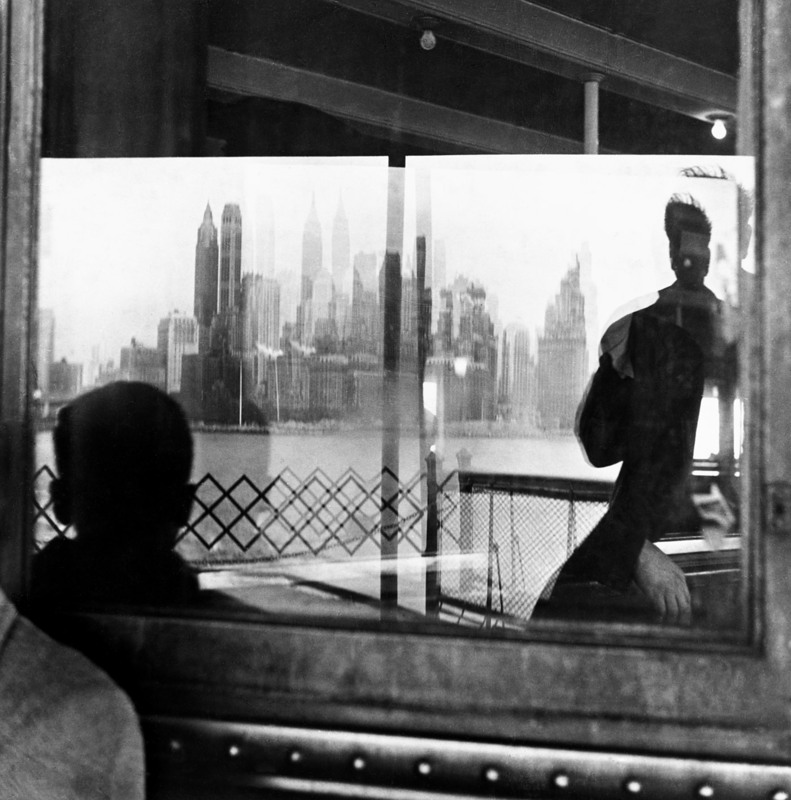 From September 9 to December 18, 2016, The Fondation Henri Cartier-Bresson dedicates an exhibition to the American photographer, Louis Faurer. This show is the occasion to discover this artist who has not been the subject of an exhibition in France since 1992. 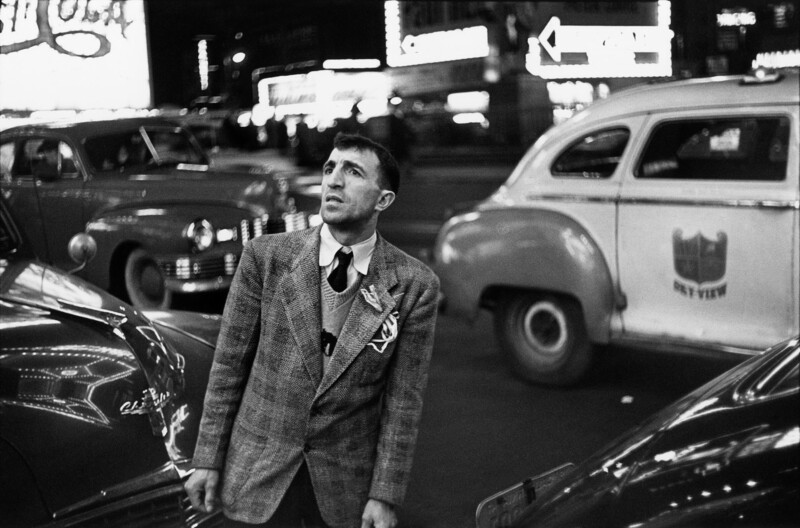 A native of Philadelphia, Louis Faurer moved to New York after the War, as if irresistibly pulled into the life of Times Square, where he homed in, objectively and pitilessly, on loneliness in the crowd. 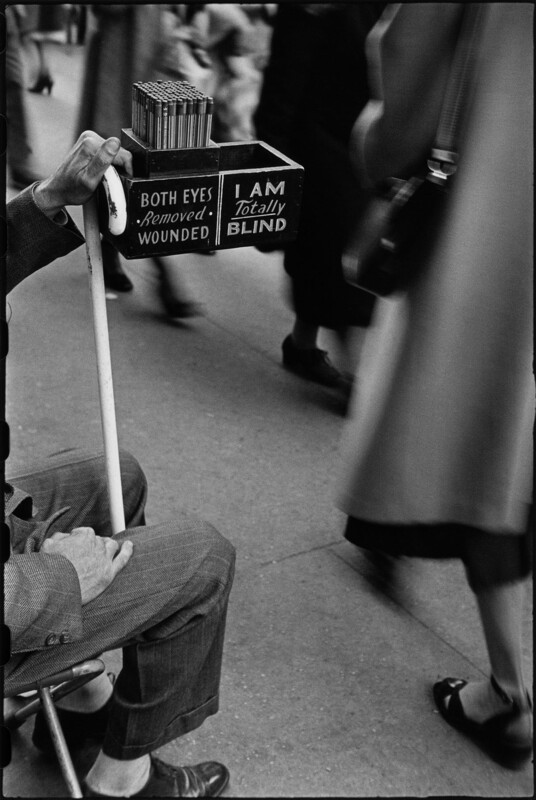 Reporting held little interest for him, and journalism even less; he was drawn – as the captions to his photographs sometimes indicate – to the poetic side: the fragility of things and the unconscious revelation. He carried out much-admired commissions for leading magazines including Flair, Junior Bazaar, Glamour and Mademoiselle. This gave rise to an unfeigned self-contempt and a paradoxical inner division only humor could counter. These assignments earned a living and helped him pursue a more personal work in New York streets. After studying drawing and being noticed by the Disney Studios at the age of thirteen, Louis Faurer started his professional path by creating advertising posters and sketching caricatures in the seaside of Atlantic City. 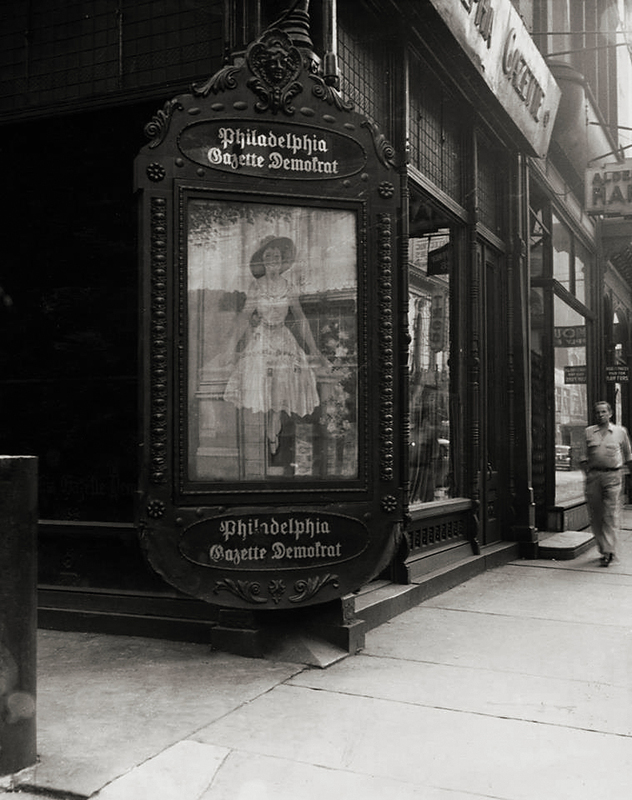 At the age of 21, he bought his first camera and won first prize for “Photo of the Week” in a contest sponsored by the Philadelphia Evening Public Ledger. Market Street would then be the scene of his first shots. In 1947, he left for New York, as Lilian Bassman, art director for Junior Bazaar, hired him as a photographer. 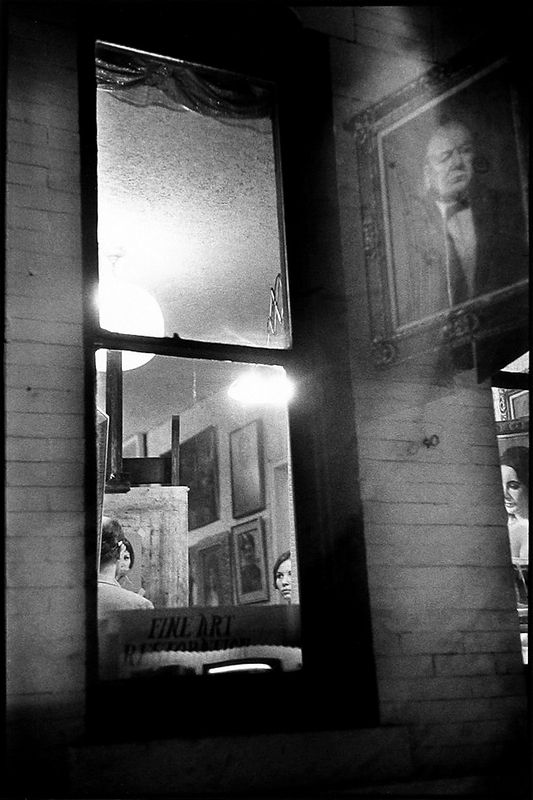 He met Robert Frank who was to become a close friend and with who he would share a studio for a while. 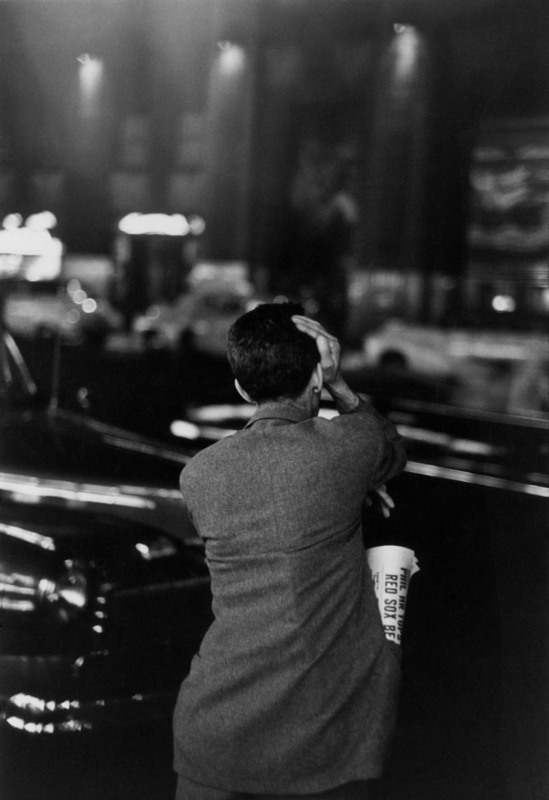 In 1968, he abandoned New York, the scene of his most successful work, for personal and financial reasons. 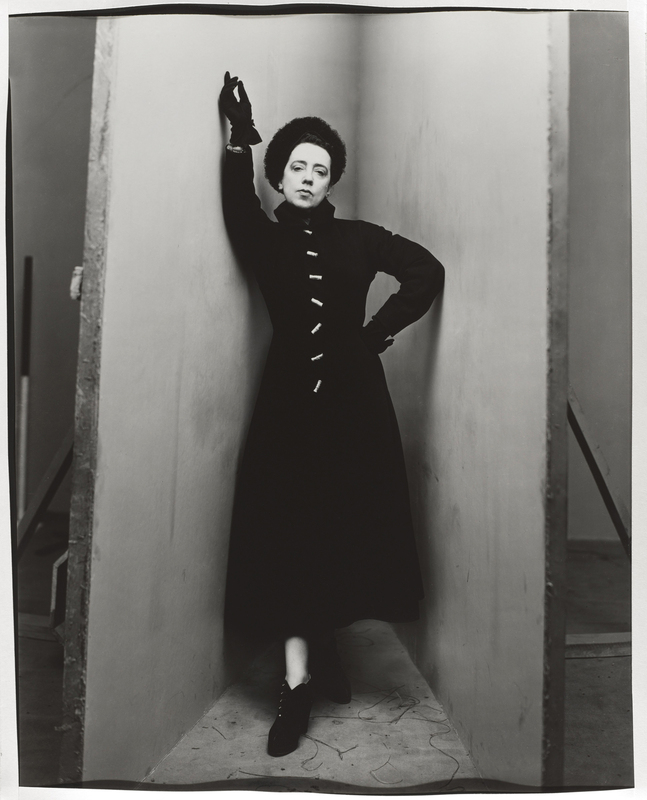 Faurer worked briefly in England, and then in Paris where he struggled doing fashion work, with occasional assignments from Elle and French Vogue. 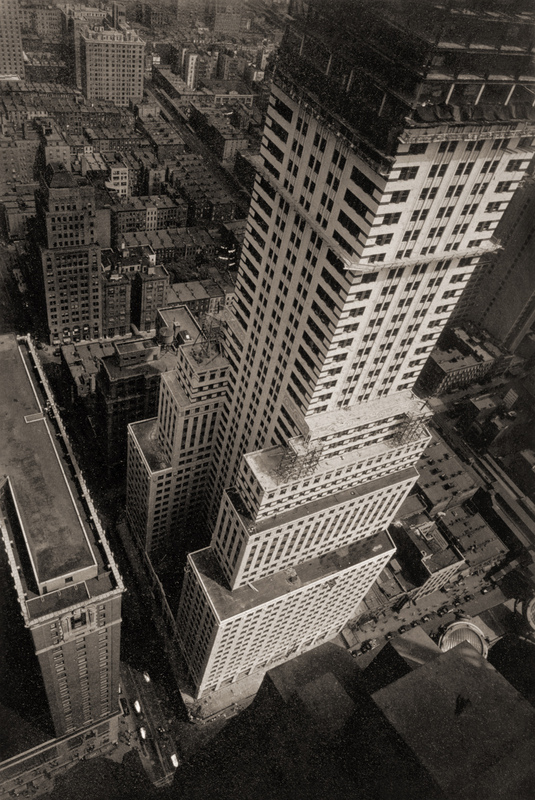 Shortly after Faurer returned to New York in 1974 at the age of 58, he found that photography was being embraced by the art world and was soon to become a commodity in the international art market. 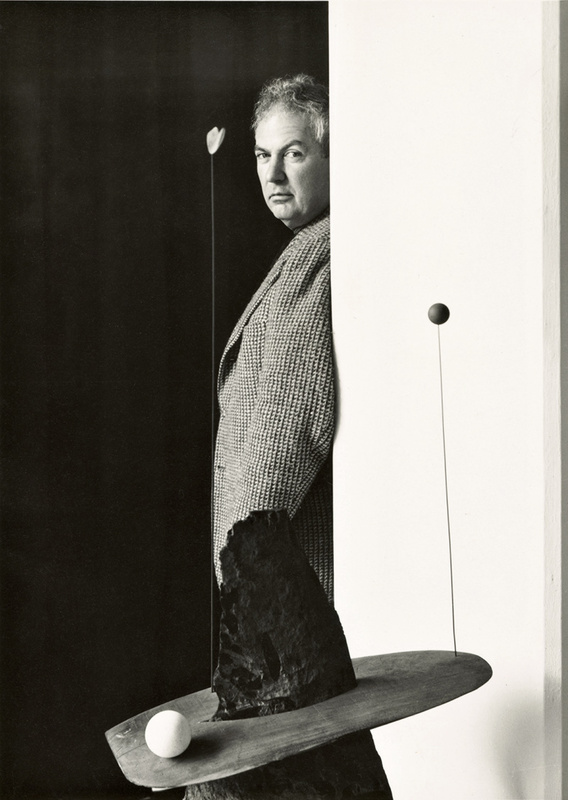 The art dealer, Harry Lunn brought his work to public attention through an exhibition at Marlborough Gallery in 1997 and resurrected his career, his contribution then began to be acknowledged. 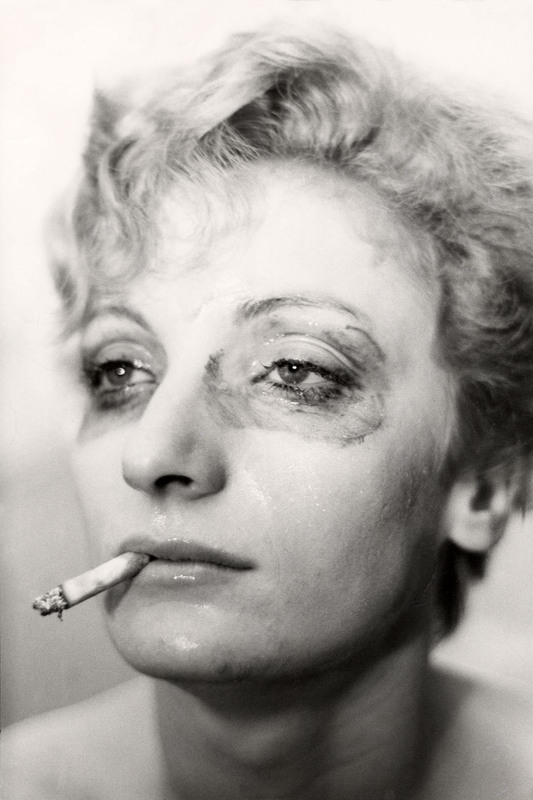 In 1984, a car in New York streets hit Faurer, his wounds prevented him to pursue his career as a photographer. He passed away in Manhattan on March 2, 2001. 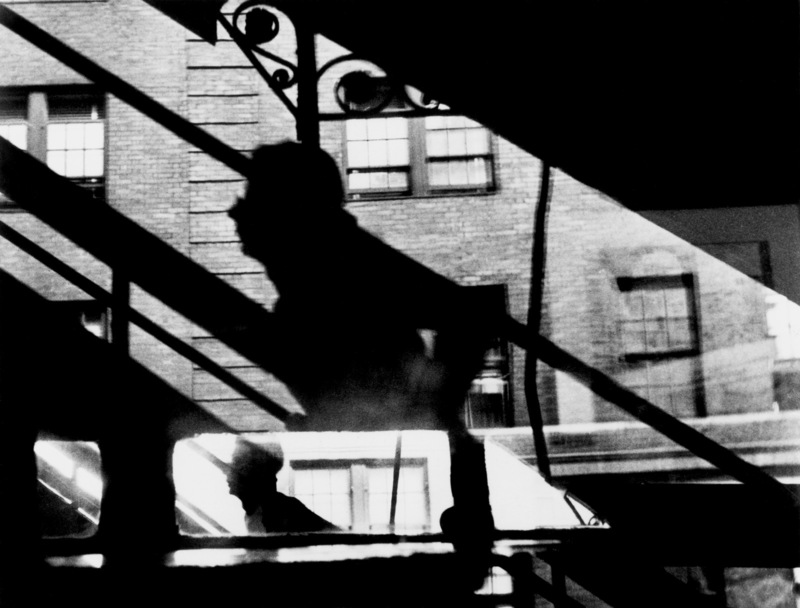 Deeply concerned with what he saw, he shares his doubts with us as he chooses anonymous figures spotted amid the ordinariness of the sidewalk: figures pulled out of the ambient melancholy, the film noir, the pervasive distress that seem to have been his personal lot. 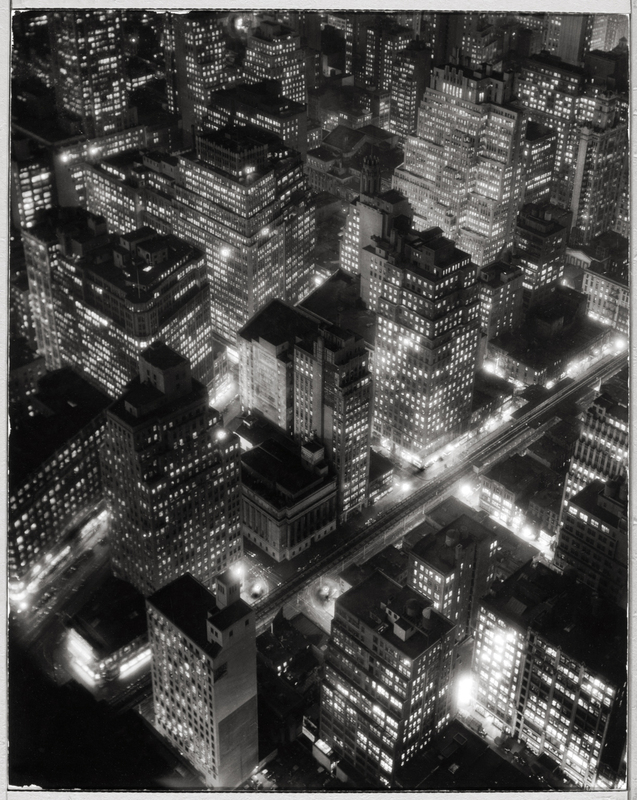 A remarkably gifted printer, Faurer experimented with blur, overlaid negatives and the marked graininess resulting from his fondness for the nocturnal. 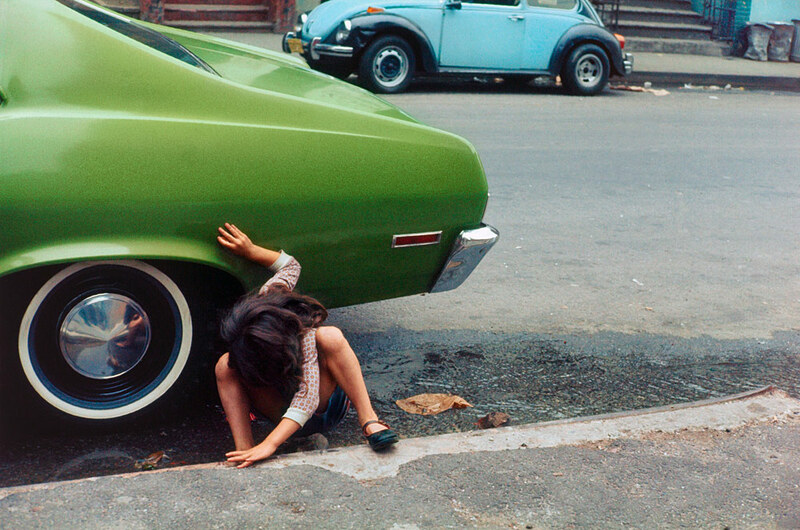 His touchiness meant frequent problems with clients and people like the numerous photographers who tried to lend a helping hand; among the latter was William Eggleston, who had discerned the unique depth of Faurer’s work. The issue the elegant Japanese photography quarterly déjà vu devoted to him in 1994 speaks of a rediscovery and a style ahead of its time, and quotes Nan Goldin: “Some people believe again that photography can be honest”. 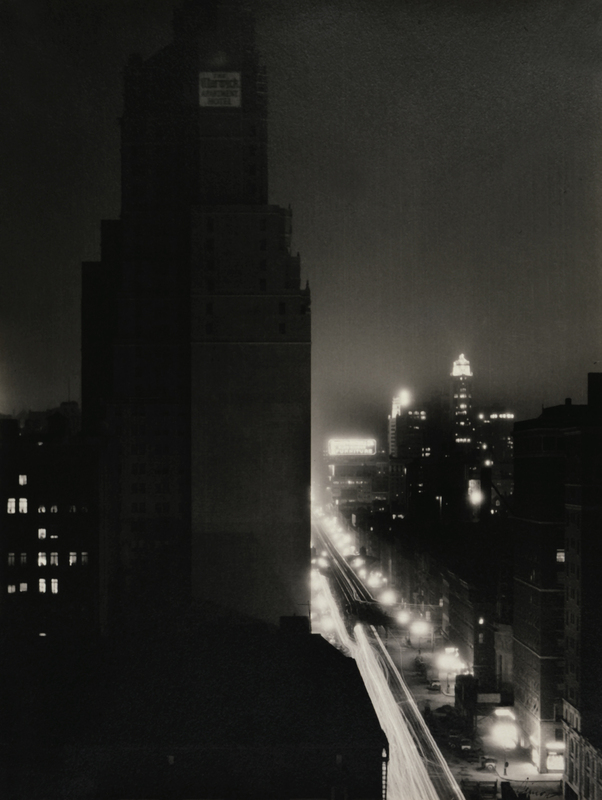 In 1948, Edward Steichen, Head of the Department of Photography of the MoMA, supported Faurer and included him in In and Out of Focus. 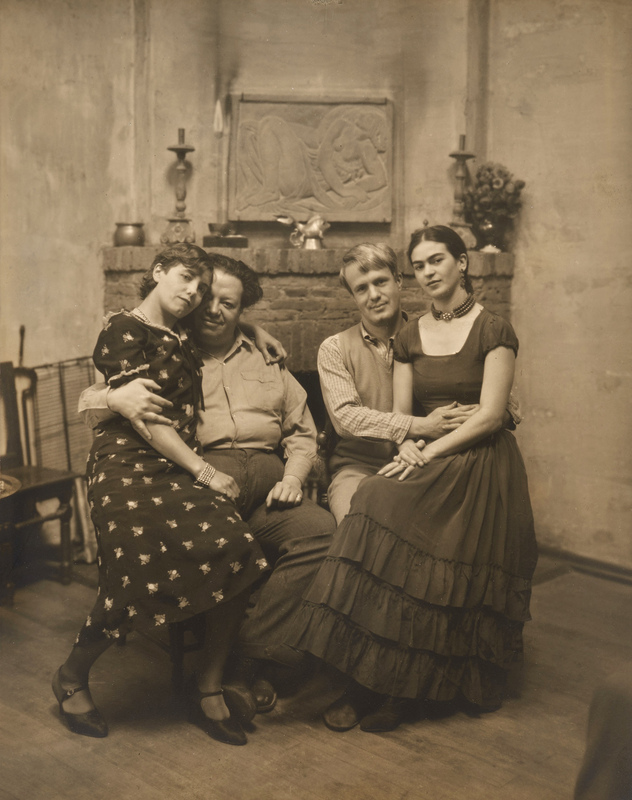 Steichen wrote: “Louis Faurer, a new comer in the field of documentary reporting, is a lyricist with a camera, a seeker and finder of magic in some of the highways and byways of life.” Afterwards, Steichen presented Faurer photographs in a few other exhibitions and in particular The Family of Man, in 1955. 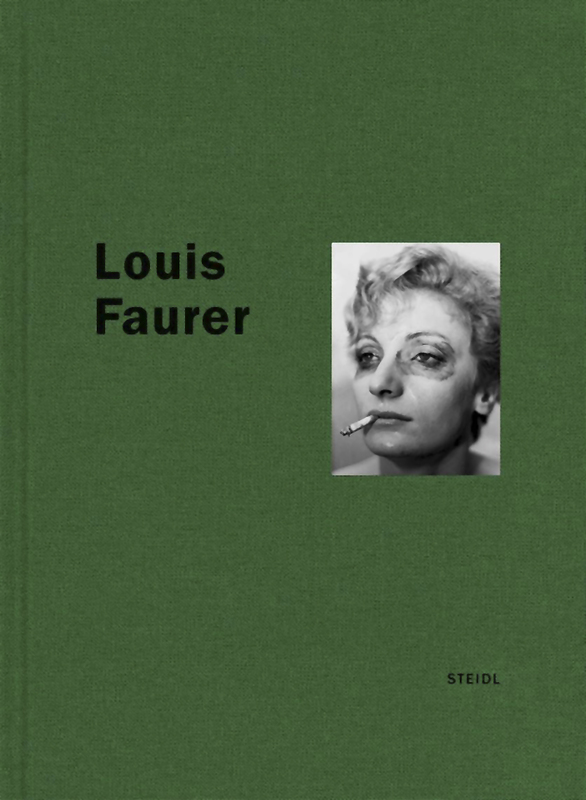 During his lifetime, Faurer did not have the wherewithal to edit his photographs into a book. My earliest experience in art occurred at the Benjamin Rush Public school in Phila., Penna. Miss Duncan, who seemed to float on a rose petal scent, having requested that numbers be written on paper with lead pencil, was shocked when my sheet yielded a drawing of a locomotive. My next surprise, at the age of 13 arrived in the mail. I had submitted my drawings to Walt Disney and he proposed considering me for a position, although he couldn’t guarantee it, if I travelled to California. It seemed unreachable and so I didn’t go. After graduating the South Phila. High School for Boys, I enrolled in a Commercial Lettering School. After months of hand trembling, I looked at my first sign, it read “FRESH FISH”. From 1934 to 1937 I sketched caricatures on the beach at Atlantic City, N.J. My interest in photography began in 1937. It was greatly intensified when I was awarded first prize in the Philadelphia Evening Public Ledger for the photo of the week contest. Soon, the Farm Security Administration’s early books became my bible. 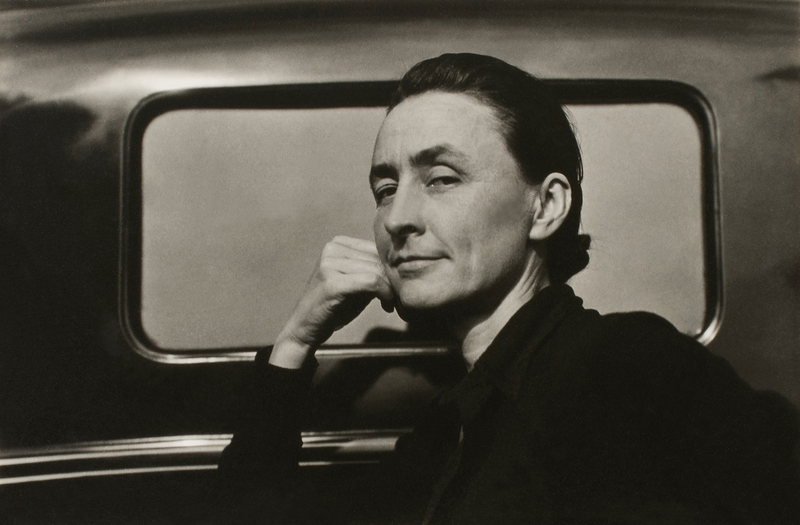 I was especially taken by Walker Evans’ photography. The world of Harper’s Bazaar also fascinated me. 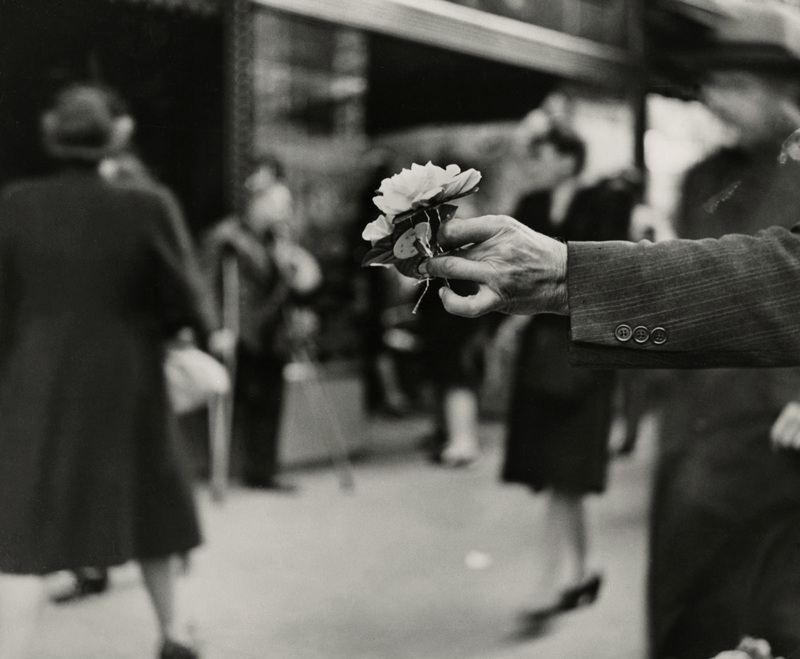 Later, in New York, I was to meet Robert Frank at the Bazaar Studio. Since I was a commuter, he invited me to stay at his loft together with nine cats. He had recently arrived from Switzerland and was alone. New York enchanted and amazed me. Everywhere a new discovery awaited me. Rejection slips from U.S. Camera were transformed into reproduced pages. My work was being accepted, often it seemed unreal. 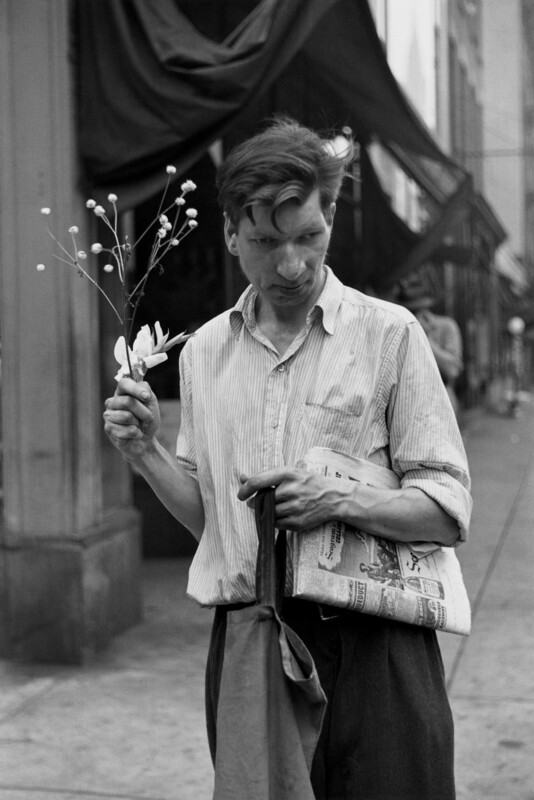 I showed my photographs to Walker Evans. A handsome brass tea kettle in his tiny room in the offices at FORTUNE projected his stability and eloquence. “You wouldn’t photograph fat women, would you?” he asked me. Later he warned me, “don’t become contaminated.” My need to continue photographing was solved by photography for commerce. I worked for periodicals which included Harper’s Bazaar. 1946 to 1951 were important years. I photographed almost daily and the hypnotic dusk light led me to Times Square. 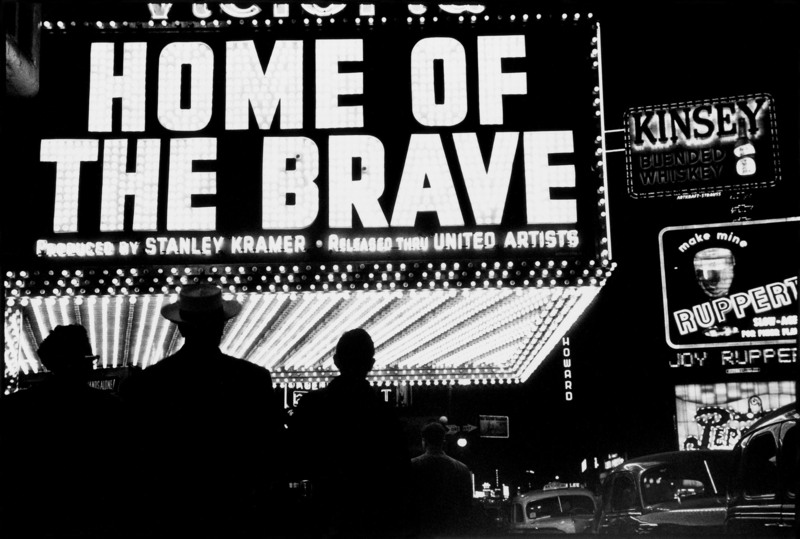 Several nights of photographing in that area and developing and printing in Robert Frank’s dark room became a way of life. He would say, “whatta town”, “whatta town”. 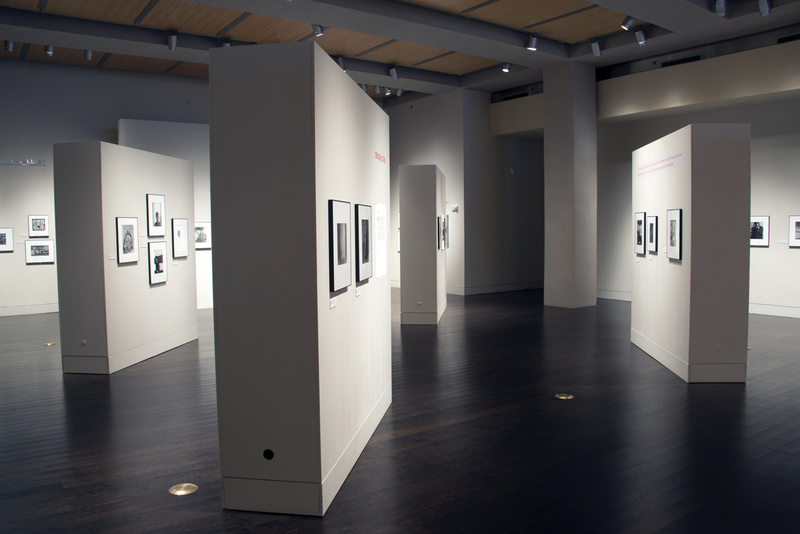 I was represented in Edward Steichen’s IN AND OUT OF FOCUS exhibit. Then, work, work, and more work. 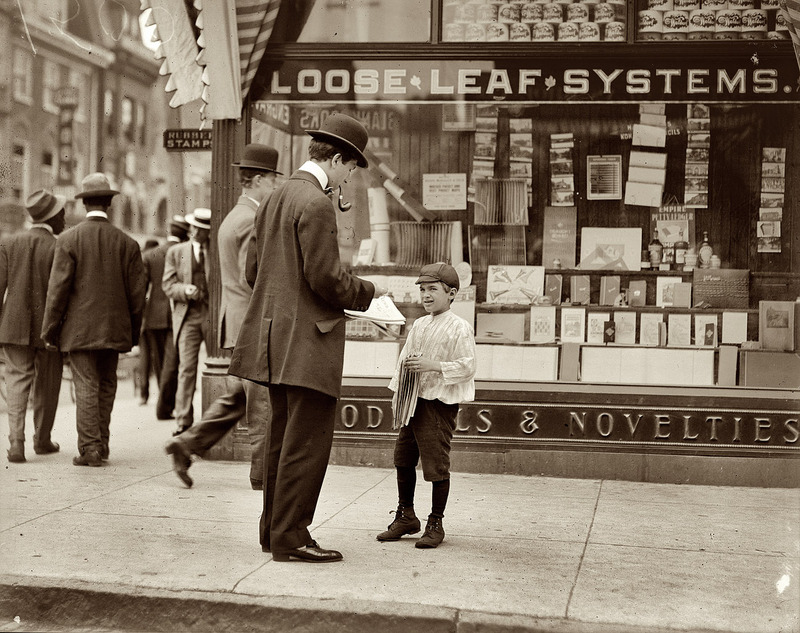 “Boy,” he boomed, “go out and photograph and put the prints on my desk.” This command was synchronized with a pound of his fist on the glass top desk. I thought it miraculous, that the glass did not shatter. I tasted and accepted the offerings of the 50s and 60s. LIFE, COWLES PUBLICATIONS, HEARST and CONDE NAST, enabled me to continue with my personal photography efforts. 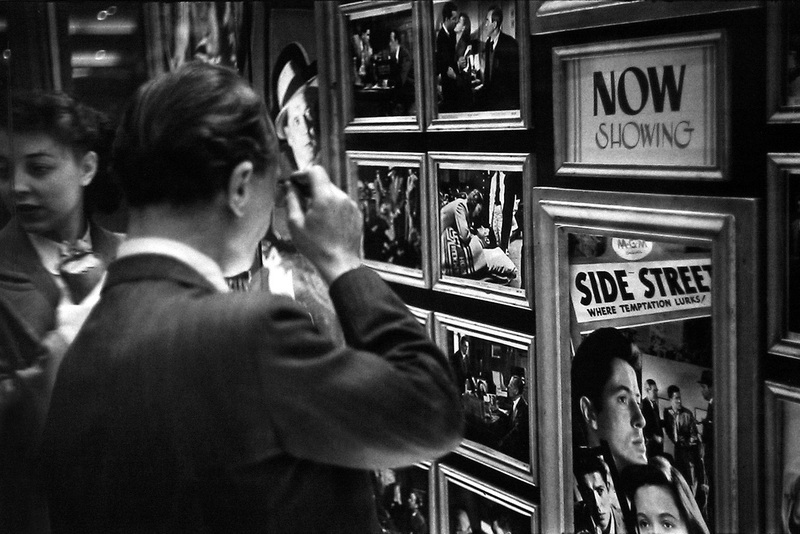 Often I would carry a 16mm motion picture camera as I would a Leica and photograph in the New York streets. The results were never shown commercially. The negative has been stored. 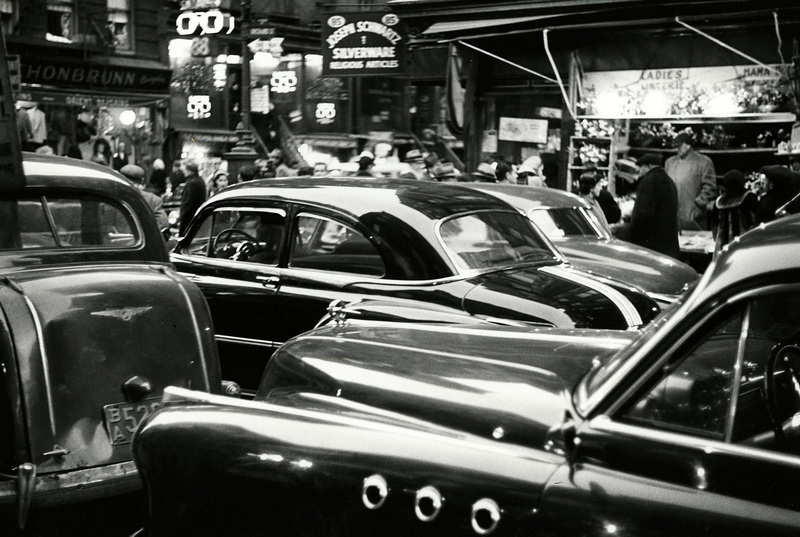 New York City has been the major center of the Faurer’s work, and that city’s life at mid-century, his great subject. The city is totally Faurer’s natural habitat. He can be at home, at one, with people on its streets, in its rooms. 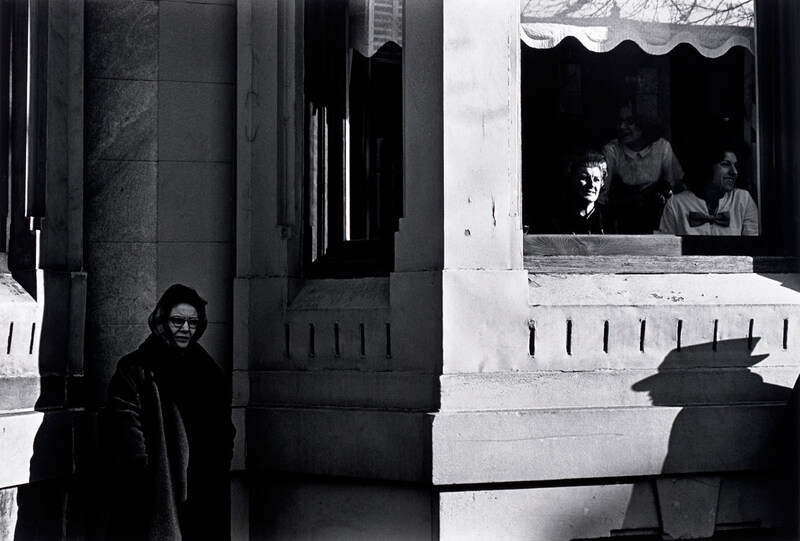 However serene or edgy his encounters, one senses Faurer (if at all) as being the same as the people in his photographs. And since these people are extremely varied, it is a transcendent vision that allows the photographer to be so many “others.” Faurer’s at-oneness with his subjects contrasts with both the mode of working and the results of Evans and Frank. They have proved to be great and wide-ranging explorers and fi nders of their images. 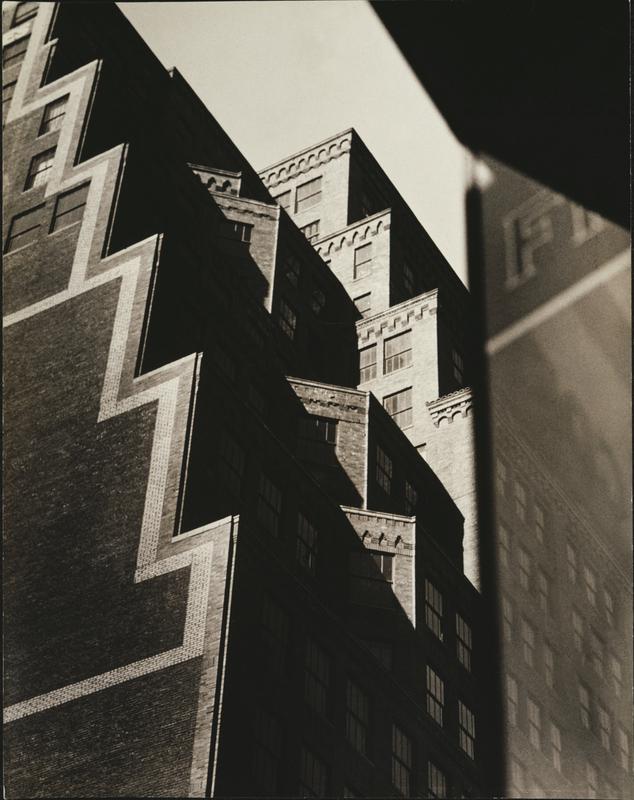 Faurer made only one important trip: from Philadelphia (where he made his first, early brilliant photographs) to New York, where he stayed, and where in the course of things his vision consumed, whether ordinary or odd, the all of it. 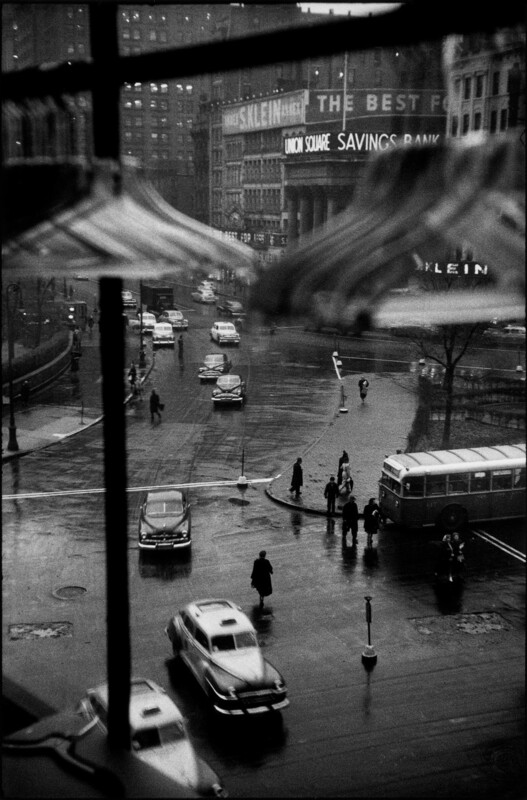 Louis Faurer was a “photographer’s photographer”, one whose work was not known to a broad audience, or appreciated by the art world, but was loved by photographers. 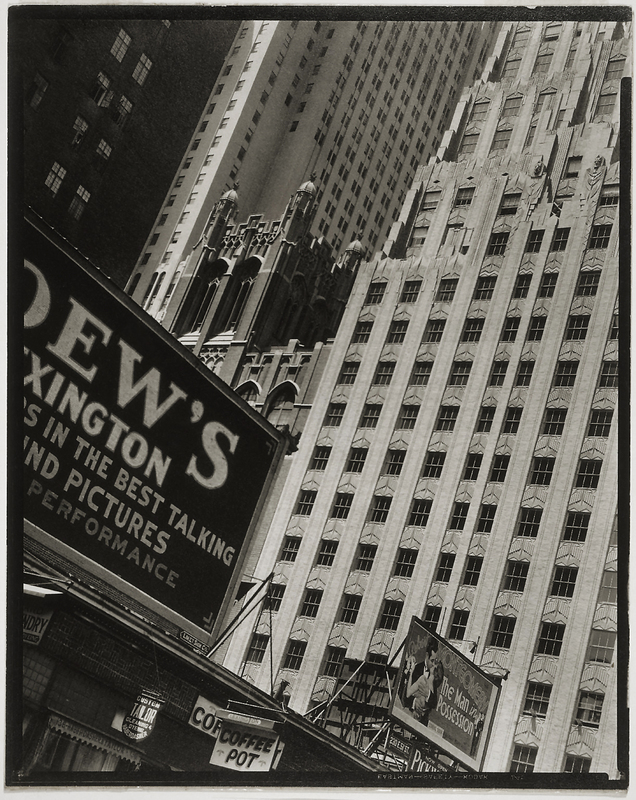 They saw in his pictures a purity of seeing, akin to what Faurer saw in the work of Walker Evans, the “poetic use of facts”. Faurer distinguished himself within this way of working through his instinct and his uncanny eye for people who radiate a rare and convincing sense of privacy, an inner life. They are people who would be true in any time and place,who are emblematic of human struggle. For whatever reasons, Faurer did not have the wherewithal to edit his photographs into a book, the most visible and long-lasting expression of a photographer’s work. Yet his pictures are indelible. 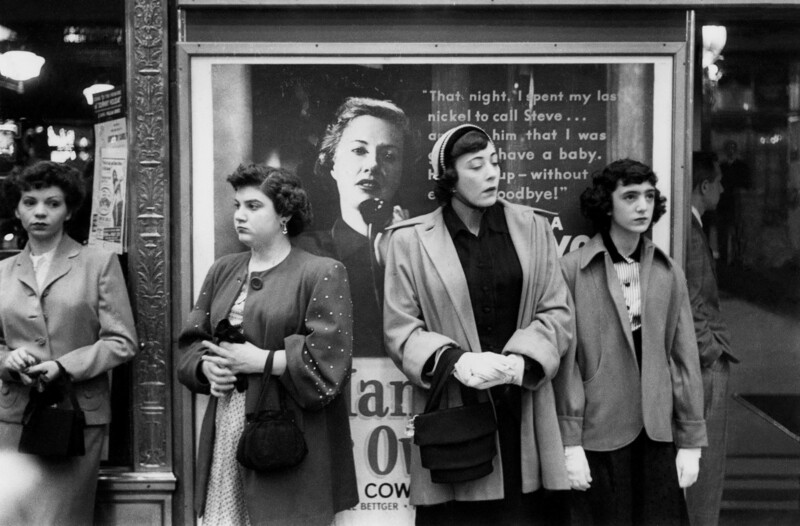 Their content presages a major shift in subject matter within the rubric of “documentary” American photography that was to come to fruition almost two decades later. 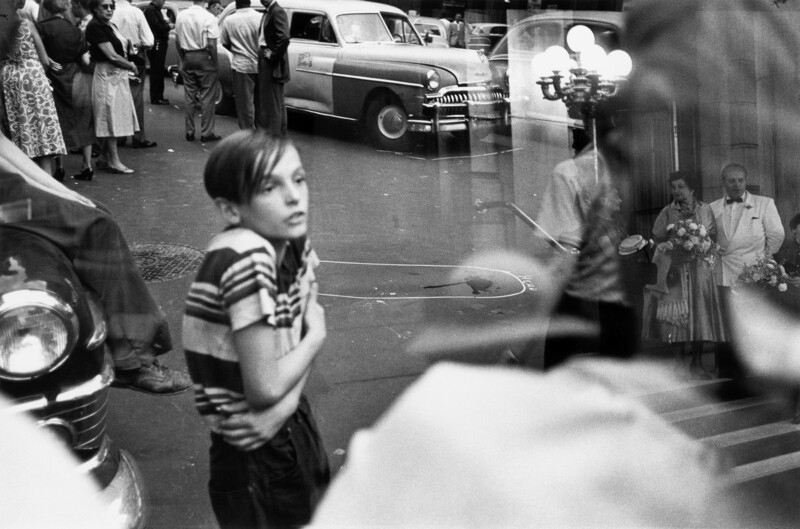 In 1967 John Szarkowski identified this radical change when he wrote in his wall text for New Documents, an exhibition at the Museum of Modern Art, about the work of Diane Arbus, Lee Friedlander, and Garry Winogrand: “…In the past decade, a new generation of photographers has directed the documentary approach toward more personal ends. Their aim has been not to reform life, but to know it”. 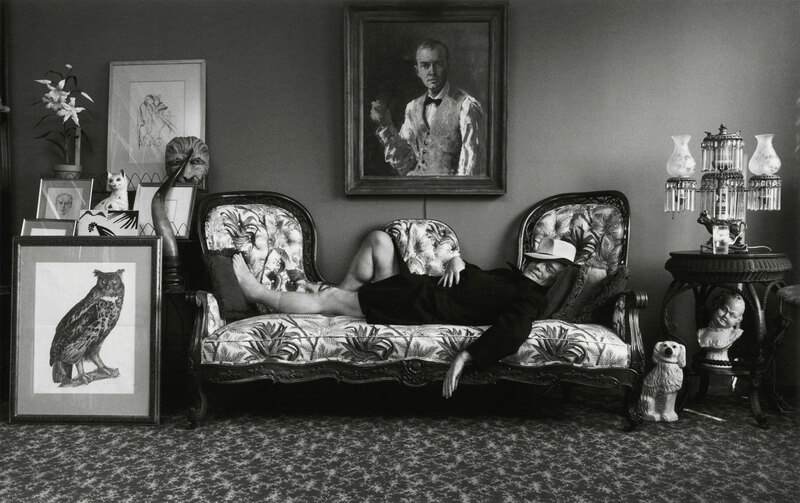 “Arnold Newman: Masterclass, the first posthumous retrospective of Arnold Newman (1918-2006), explores the career of one of the finest portrait photographers of the 20th century. 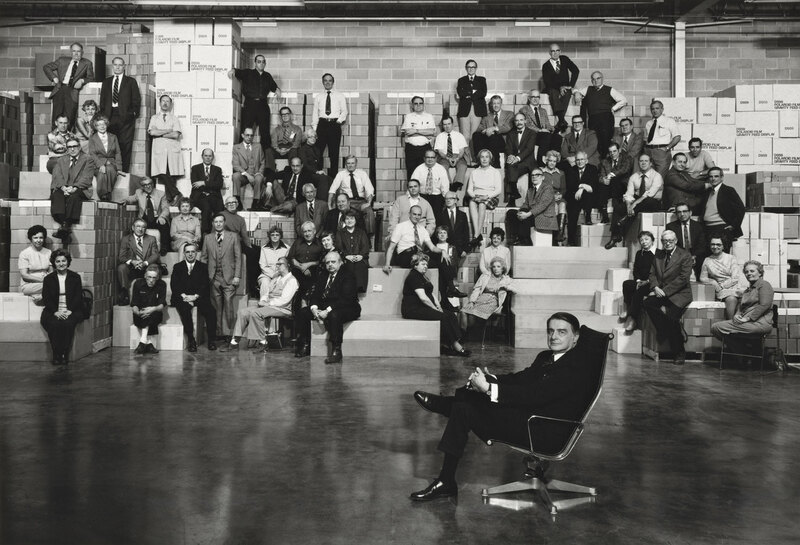 The Harry Ransom Center, which holds the Arnold Newman archive, hosts the exhibition’s first U.S. showing February 12 – May 12, 2013. 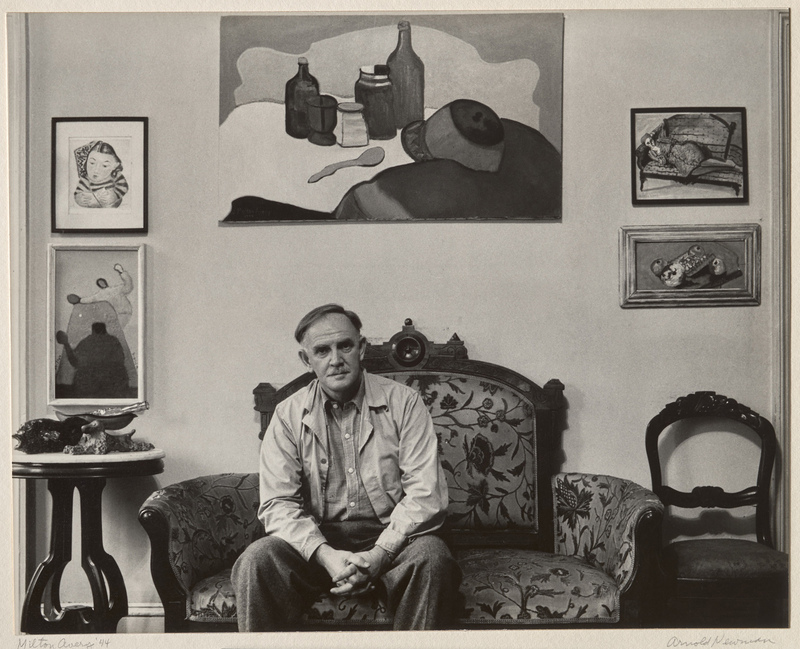 The show, curated by FEP’s William Ewing, highlights 200 framed vintage prints covering Newman’s career, selected from the Arnold and Augusta Newman Foundation and the collections of major American museums and private collectors. 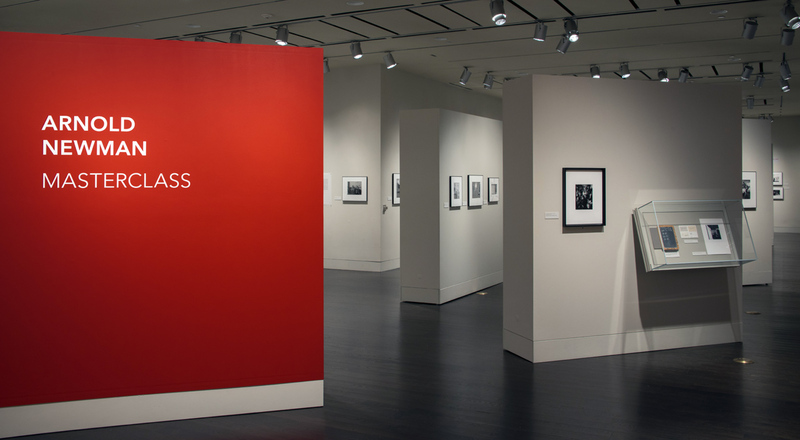 Twenty-eight photographs from the Ransom Center’s Newman archive are featured in the exhibition. 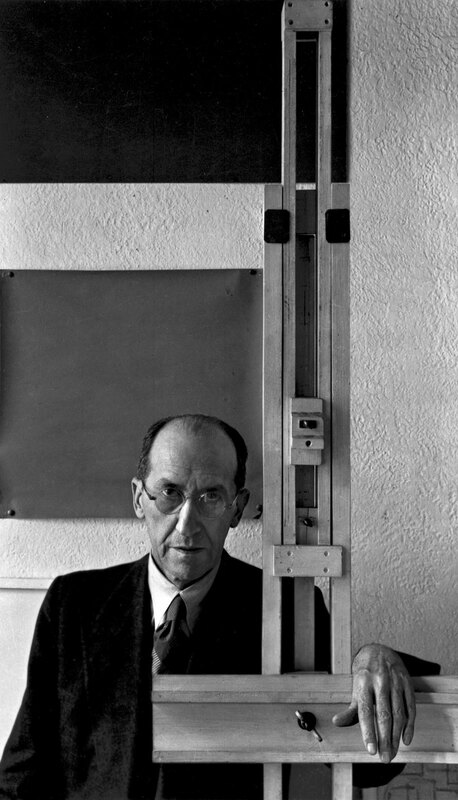 His subjects included world leaders, authors, artists, musicians and scientists – Pablo Picasso in his studio; Igor Stravinsky sitting at the piano; Truman Capote lounging on his sofa; and Otto Frank, father of Anne Frank, in the attic where his family hid from the Nazis for more than two years. 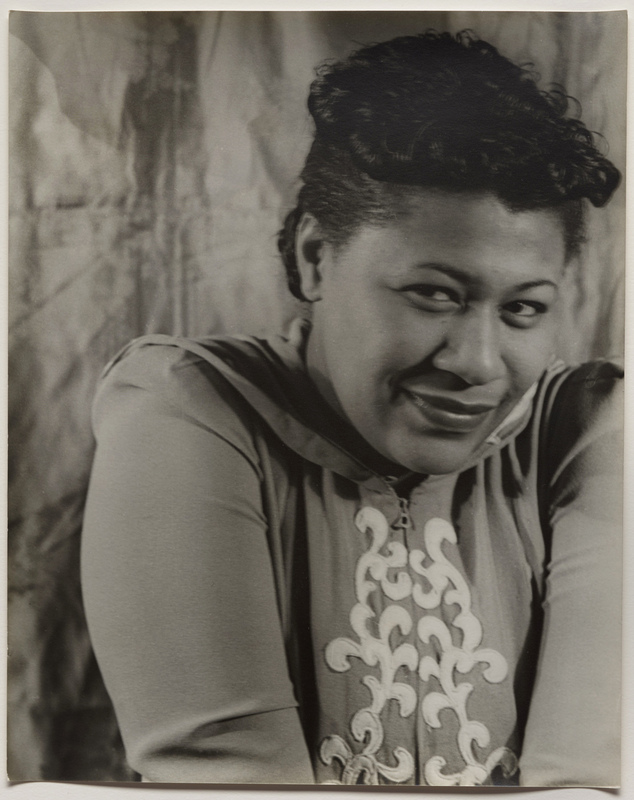 Many of Newman’s photographs show confident people, posing proudly before their accomplishments, directly engaging the viewer. But many betray a certain réticence – fragility, a hint of vulnerability, or doubt. Newman was aware that a successful artist’s career was not all roses – thorns were encountered along the path. He also regarded the act of portraiture was necessarily collaborative, or transactional; each side had their own kind of power – the sitter could resist the control of the photographer, the photographer could expose the sitter in an unflattering light. A successful portrait had to negotiate this psychological uncertainty. Sometimes Newman wanted to show supreme confidence as the mark of the man; at other times he wanted to show chinks in the armour. 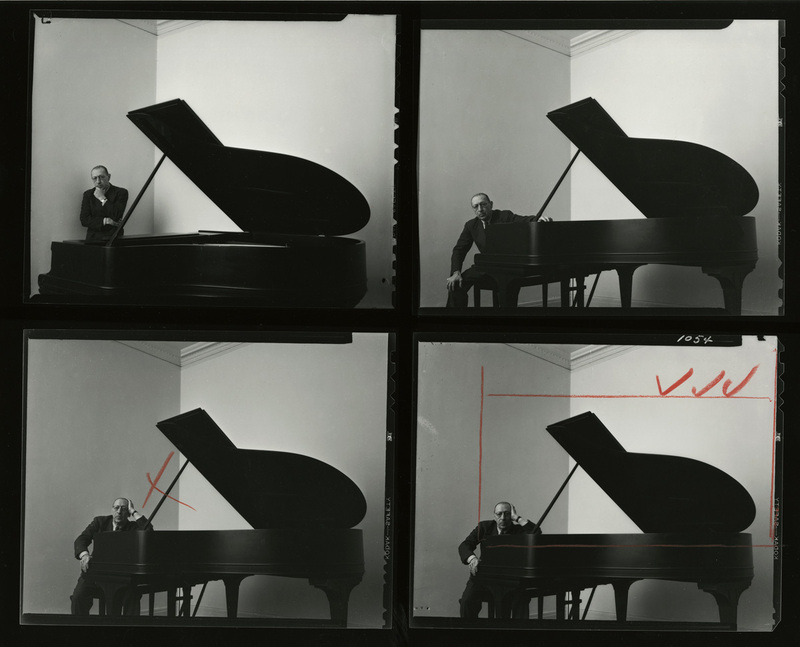 “During the second half of the 20th Century, there was no portrait photographer as productive, creative and successful as Arnold Newman. 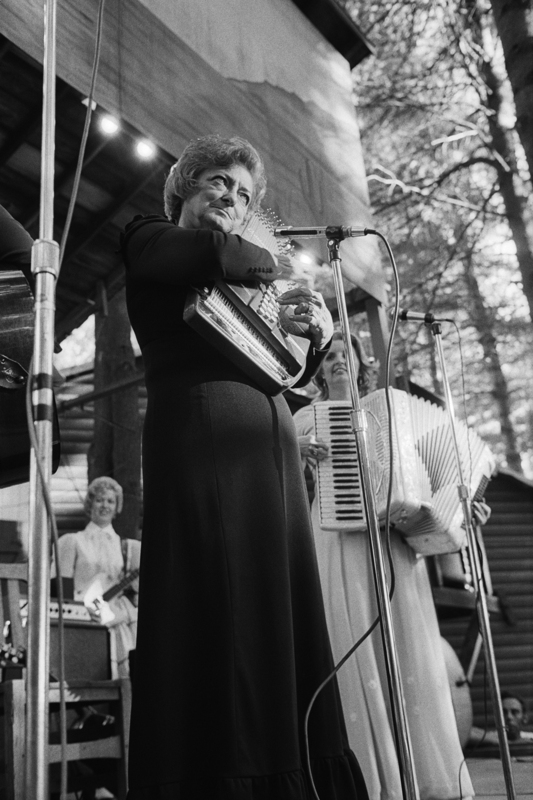 For almost seven decades Newman applied himself to his art and craft, never for a moment losing his zest for experimentation. His work was published in the most influential magazines of the day, and he was much interviewed, much quoted, and much respected. 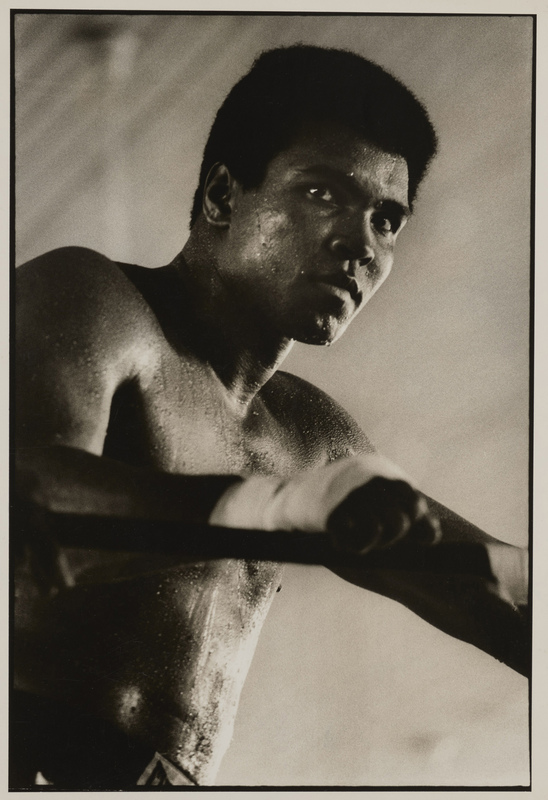 Several major solo exhibitions paid homage to his achievements during his lifetime, and his work can be found in many of the world’s most prestigious photography collections. No historical overview of portraiture would be complete without one or two Newman masterpieces, nor could any general history of the medium safely leave out his superb Stravinsky, Mondrian or Graham. 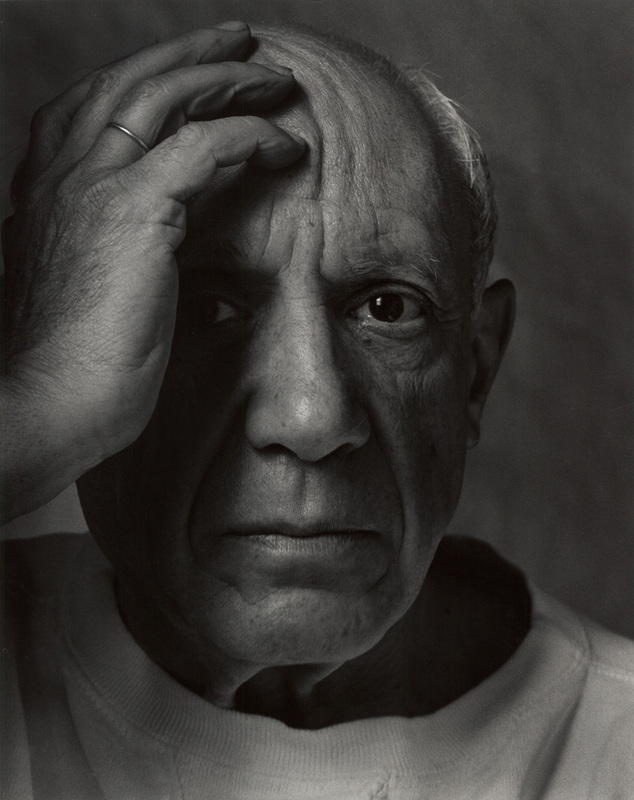 Surprisingly, many of Newman’s superb portraits have never been shown or published. 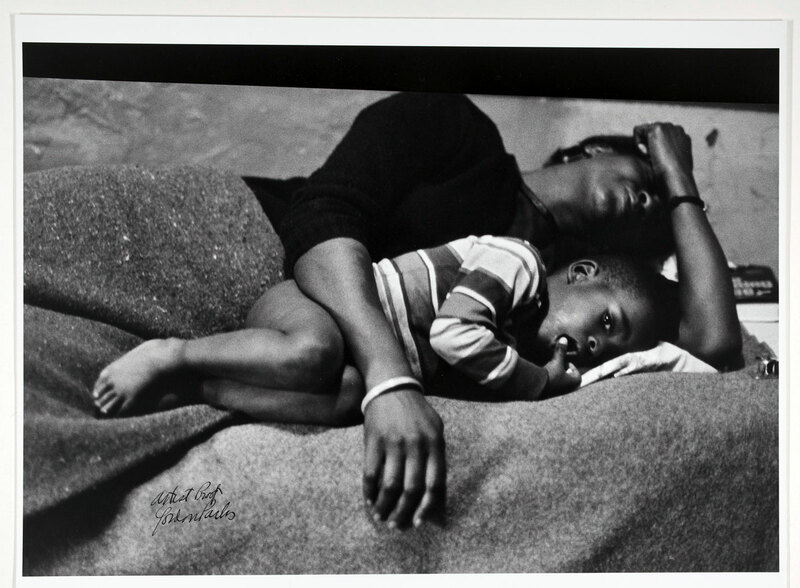 This, his first posthumous retrospective, features a wide variety of such photographs. 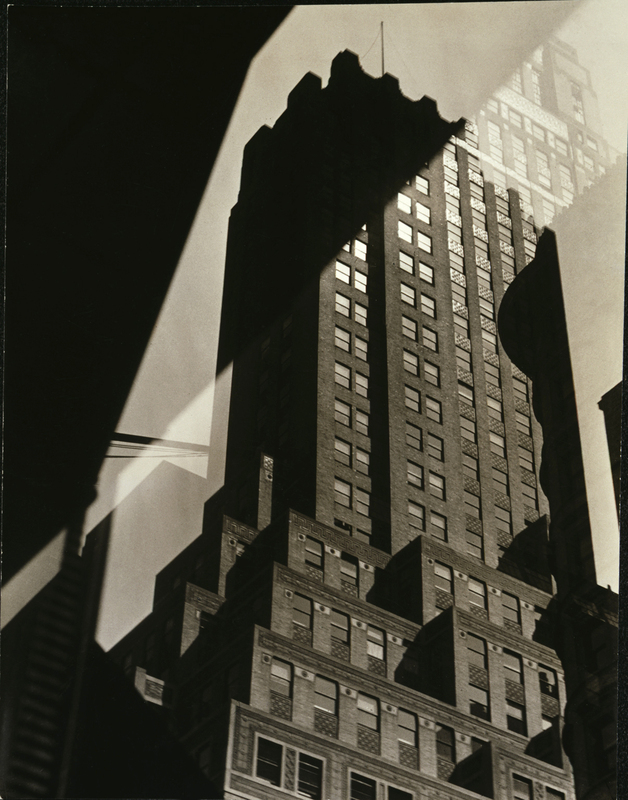 Moreover, it includes cityscapes, documentary photographs and still lifes that have rarely if even been exhibited. Even people already familiar with Newman’s work will find scores of unexpected images, rivaling the work the ‘icons’ they admire. 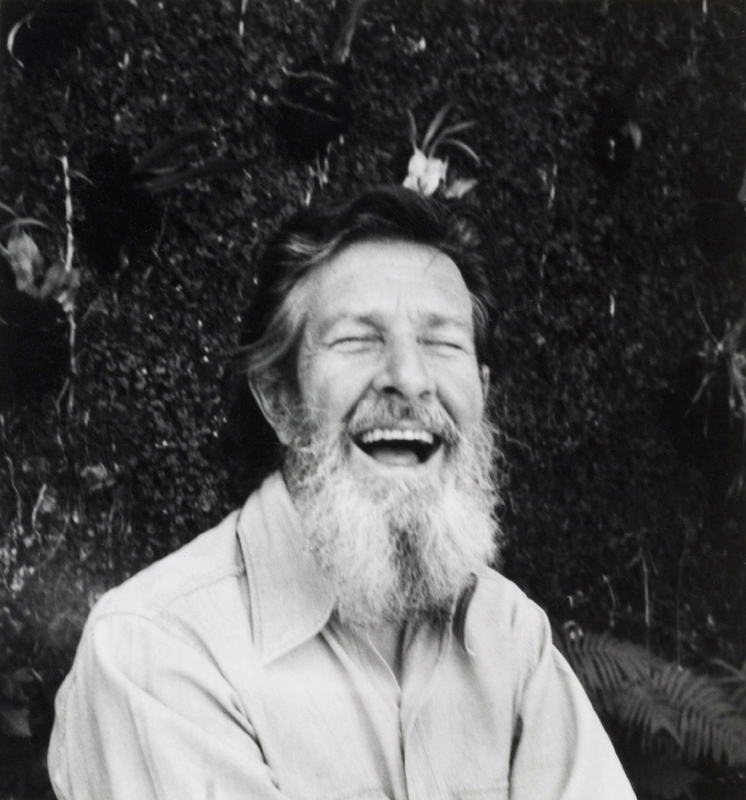 Newman was never happy with the label, often applied, of ‘father of environmental portraiture’. 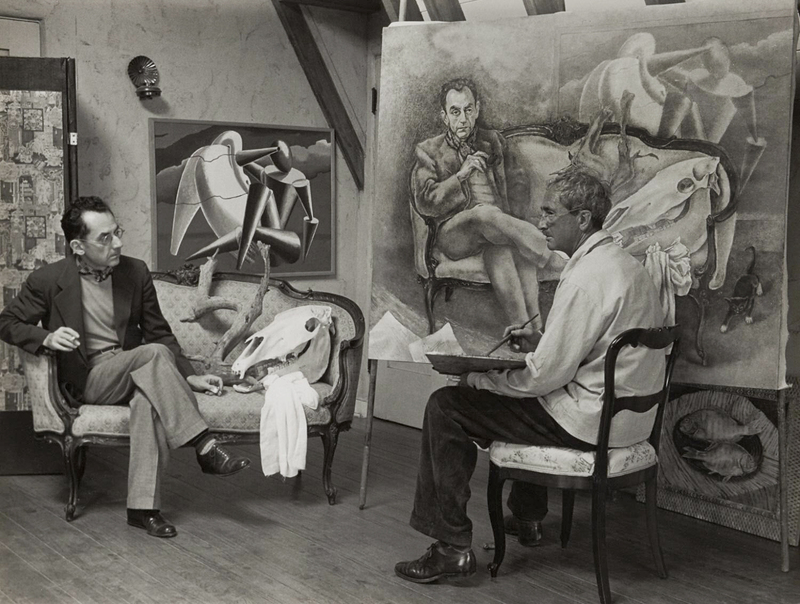 He argued that his portraits were much more than simple records showing artists posing in their studios; there was a symbolic aspect too, and an emotional/psychological element, both fundamental to his approach. He asked critics to ignore all labels, and judge his portraits simply as they would any photographs. 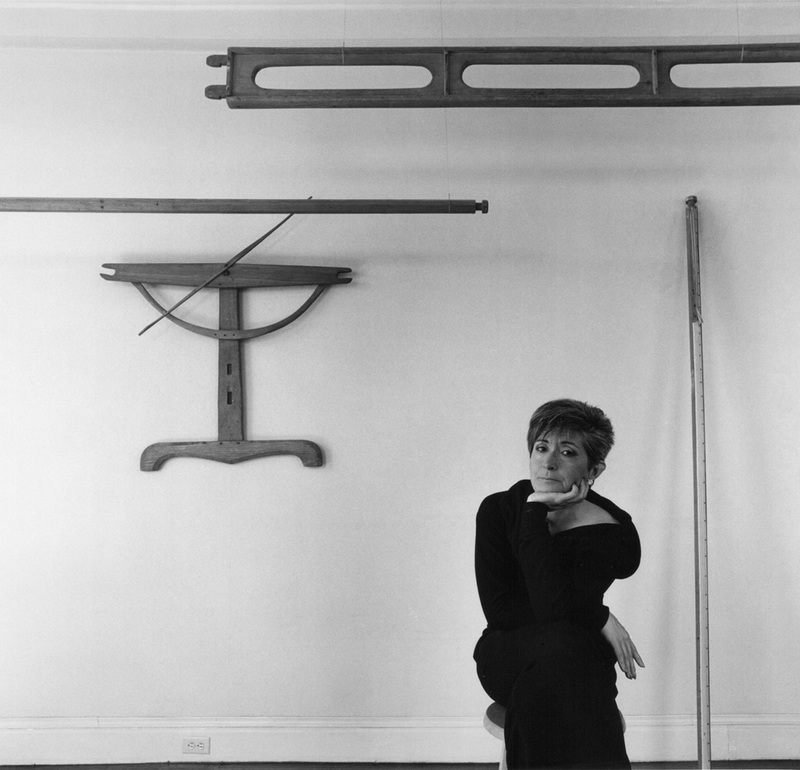 One of Newman’s favorite strategies was to place the sitters in front of his or her own work. They seem to be saying: ‘Here is my work. This is what I do’. 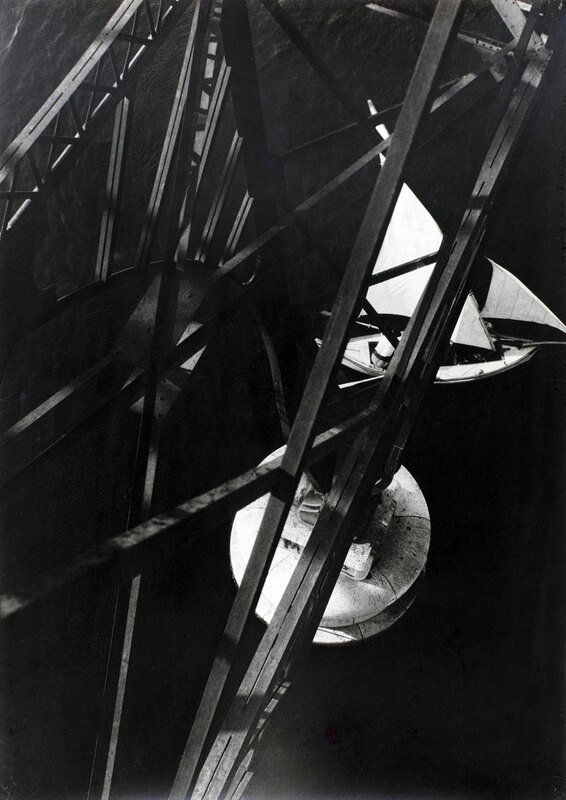 Architects pose beside buildings and models, a test pilot beside his jet, a photographer in front of his prints, a furniture designer in his chair, scientists in front of their equations… At first glance, the pictures appear natural, giving the impression that Newman had surprised his subjects at work, but in fact the set-ups were meticulous. In the hands of a lesser talent,such a technique could have developed into a routine uniformity, but Newman’s curiosity and genuine interest in his subjectsʼ work guaranteed a freshness to his portraiture, year after year. 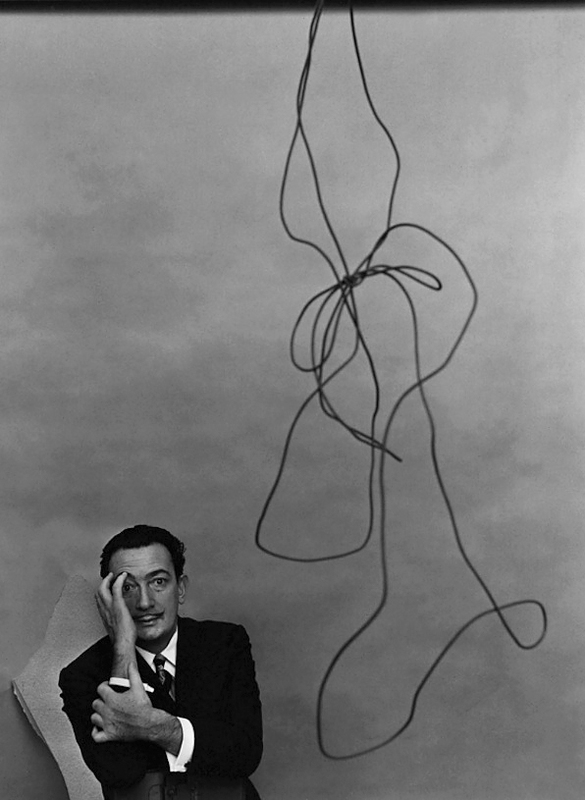 To maintain freshness, Newman advised aspiring portrait photographers to do what he did: read up about the subject beforehand, know what he or she has achieved. You will then quickly spot which elements in the environment will be useful. 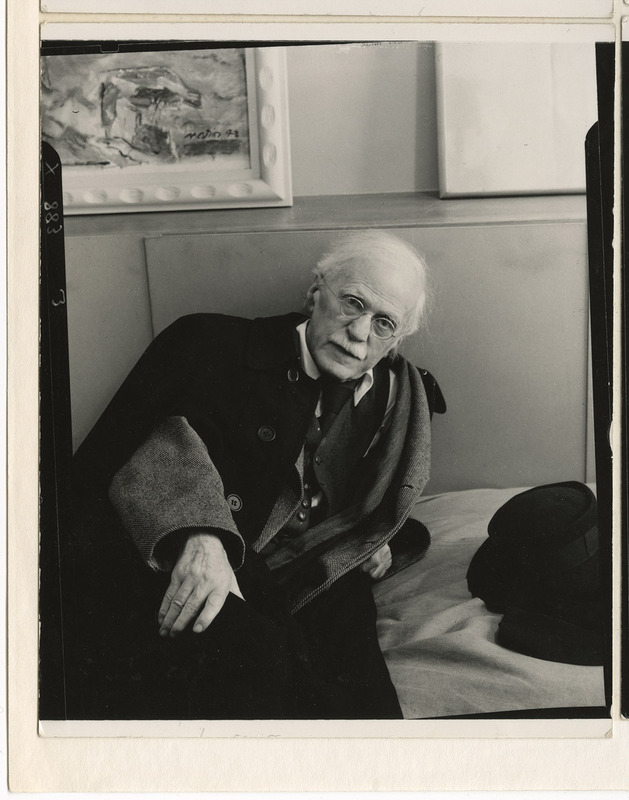 Newman writes about his encounters with artists in New York City, describing his first meeting with Alfred Stieglitz. 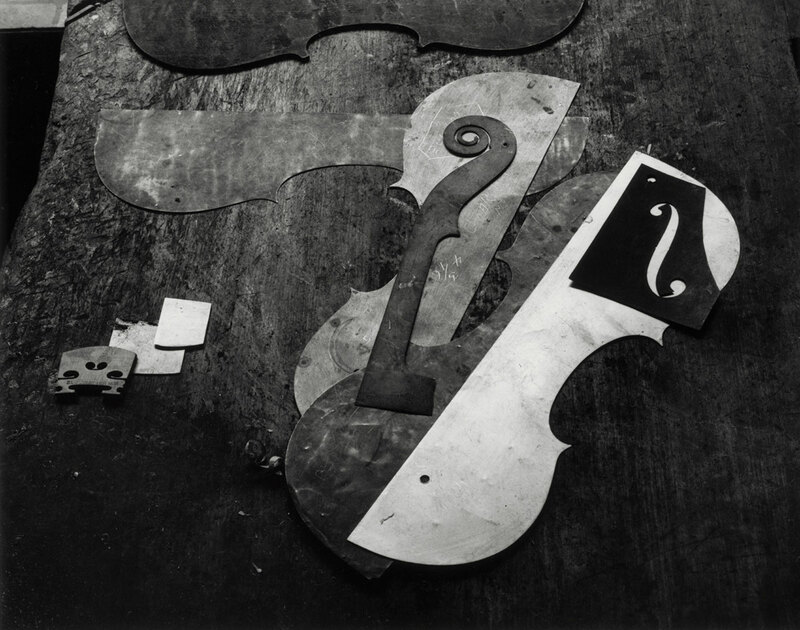 Newman never liked to work in a studio, preferring to see where and how his subjects worked and lived. 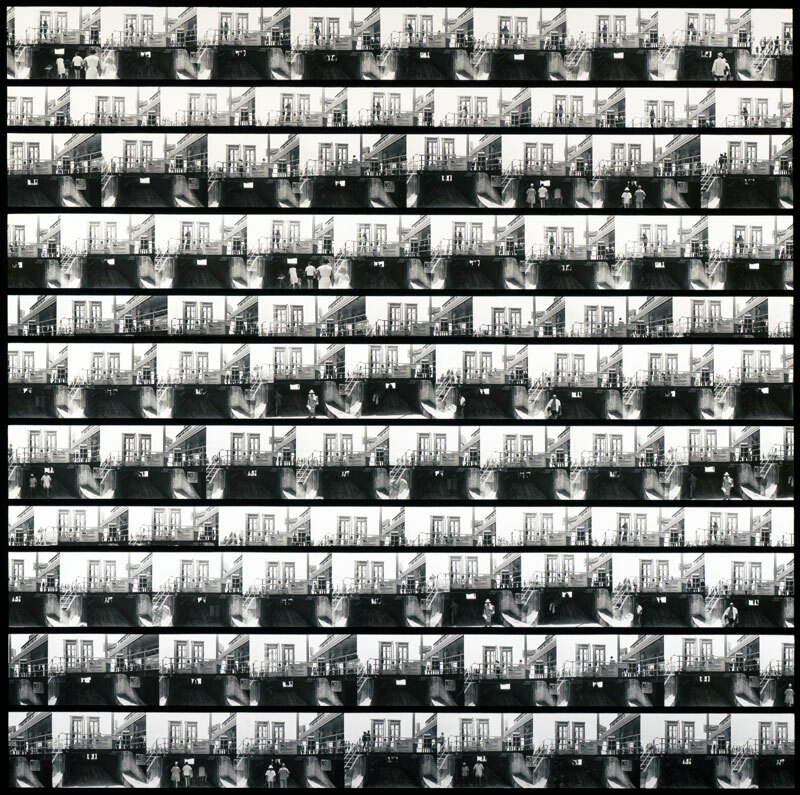 Dance studios, home libraries, classrooms, offices, living rooms, gardens, the street, and even, on occasion, a vast urban panorama were settings he employed. 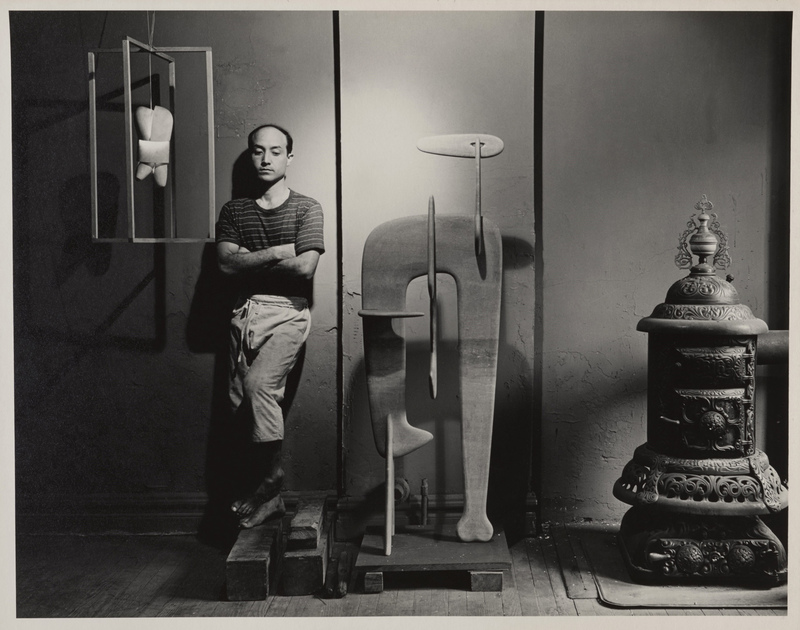 Particularly close to painters in spirit, he was stimulated by the raw materials, the paintings or sculptures in progress, and even the general clutter he found in their studios. He liked the challenge of having to make quick decisions based on what he saw around him, and argued that this spontaneous approach was much harder – and riskier – than working in his own studio, where everything was familiar and tested. By focusing on a sitter’s habitat, Newman felt that he was providing more than a striking likeness – he was revealing personality and character not through physiognomy (the principle of classic portraiture) but through the things artists gathered around them. From his earliest days with the camera, Newman loved the geomtery of space – with or without people. 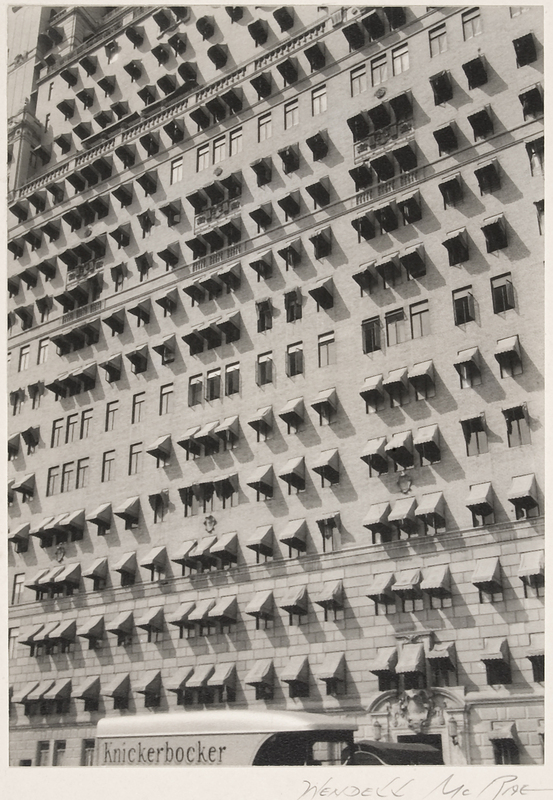 He never tired of photographing architecture that appealed to him. The linear and the curvilinear; contrasting blocks of black and white; ovals, triangles rectangles, strong diagonals… it was never just a question of making a pleasing background – like a kind of geometrically-patterned wallpaper – but rather the creation of a harmonious, dynamic whole in which the sitter was an integral part. 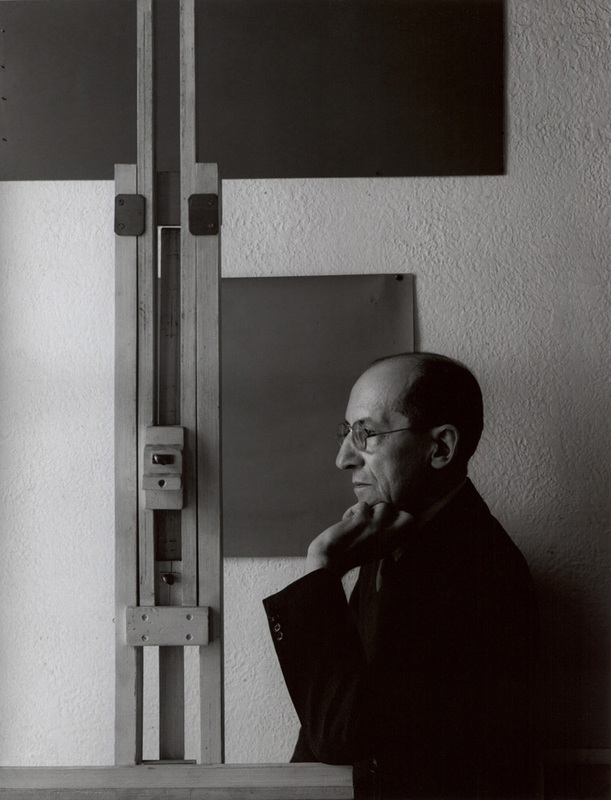 It was Newman’s consumate skill that prevented the sitter from being merely an adjunct to the design. Many thankx to The Nelson-Atkins Museum of Art for allowing me to publish the photographs in the posting. 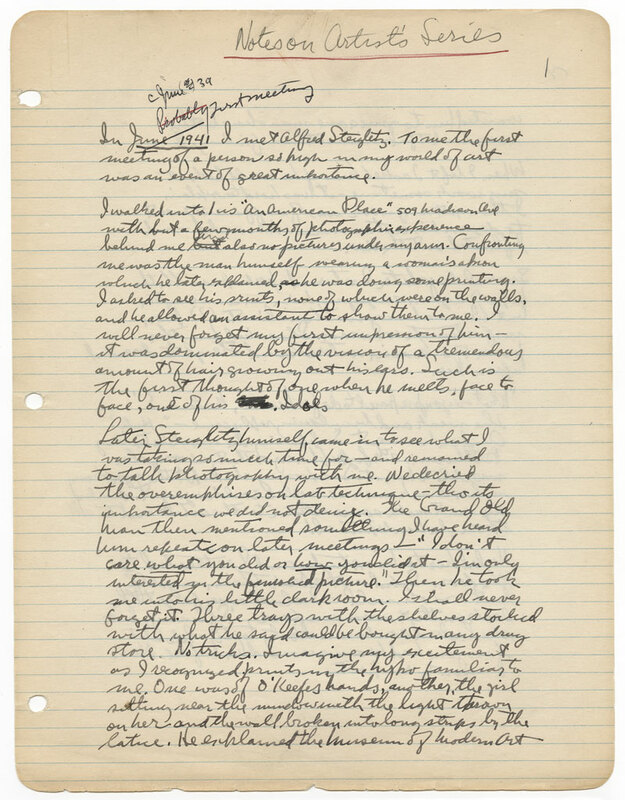 Please click on the photograph for a larger version of the image. 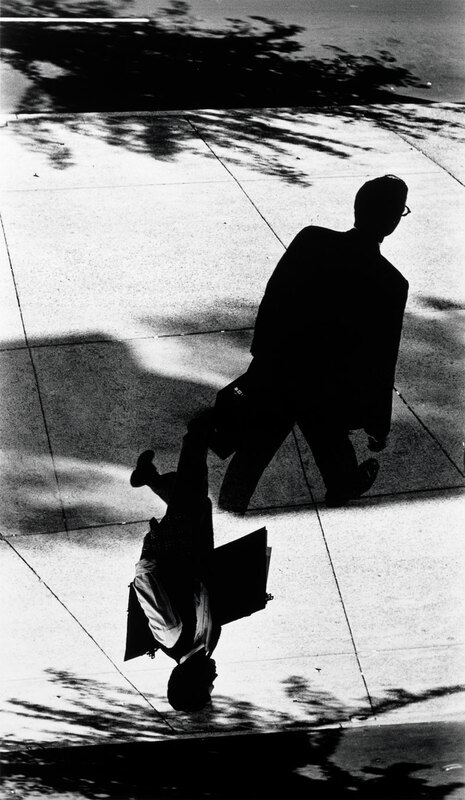 © Ray K. Metzker, Courtesy of the Laurence Miller Gallery. 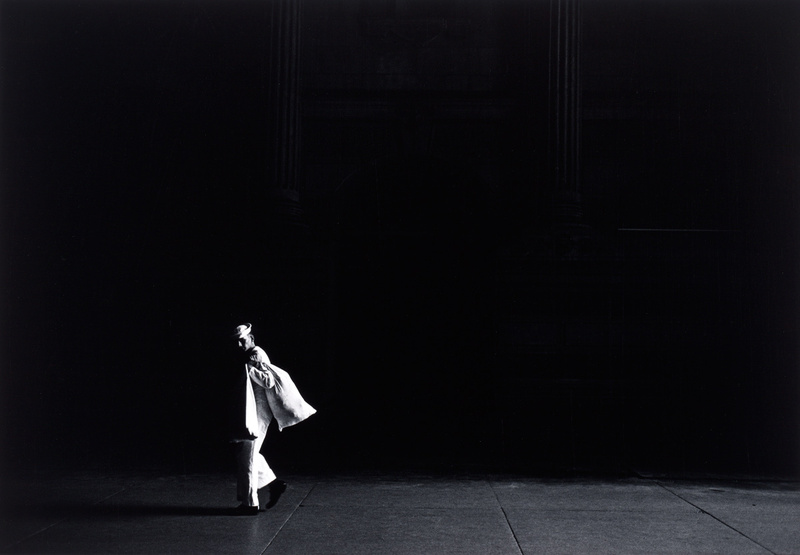 “Works by Ray K. Metzker, one of the most original and influential photographers of the last half century, will be on view from Jan. 15 to June 5, 2011, at The Nelson-Atkins Museum of Art. 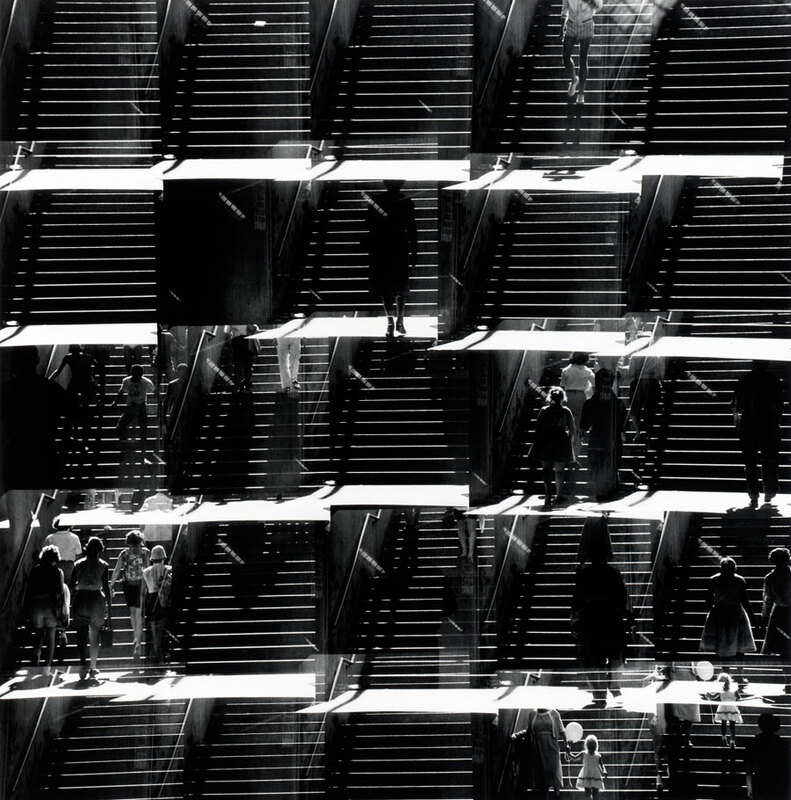 The Photographs of Ray K. Metzker will reveal Metzker’s ability to turn ordinary subjects, including the urban experience and nature, into the visual poetry of the finely crafted black-and-white print. 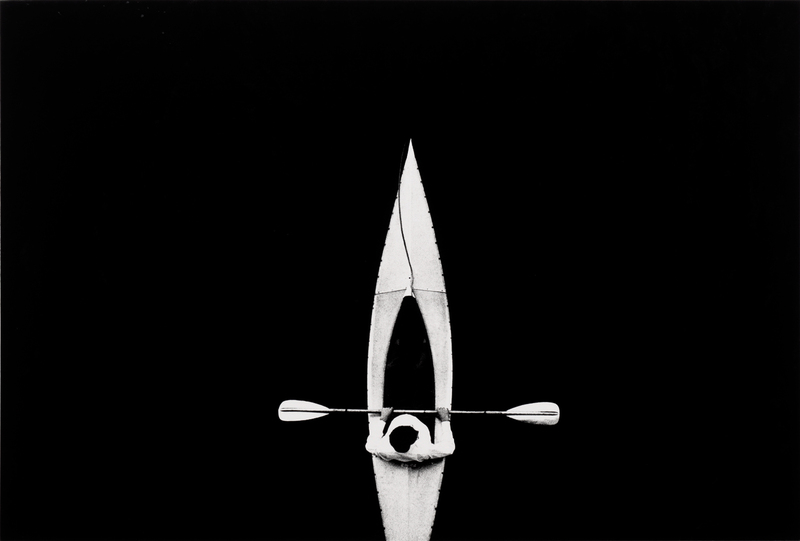 At the age of nearly 80, Metzker is greatly admired for his passionate engagement with both photography and the world. He has explored the use of high contrast and selective focus, the potentials of multiple and composite images, and the infinite gradations of daylight, from dazzling white to inky shadow. 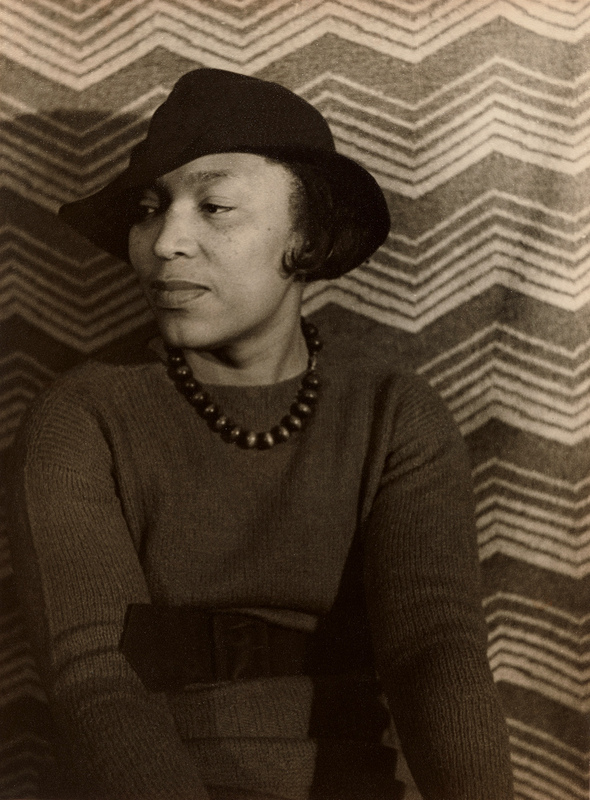 This is great and lasting work – the very best of a classic form of American modernism, said Keith F. Davis, senior curator of photography at the Nelson-Atkins. 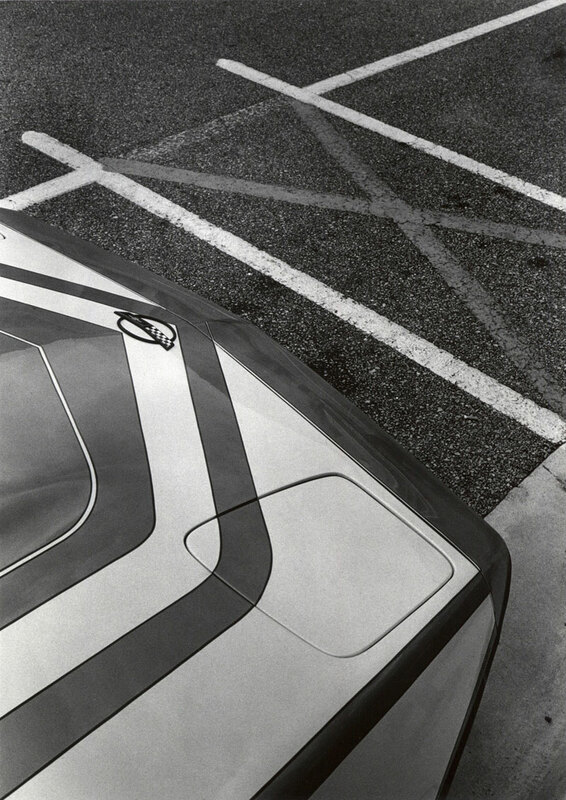 Metzker has led a life of deep devotion to understanding the potential, challenge and pleasure of photographic seeing. In so doing, he has transcended any simple notion of technical experimentation or formalism to illuminate a vastly larger human realm – one of uncertainty, isolation and vulnerability, as well as of unexpected beauty, grace and transcendence. 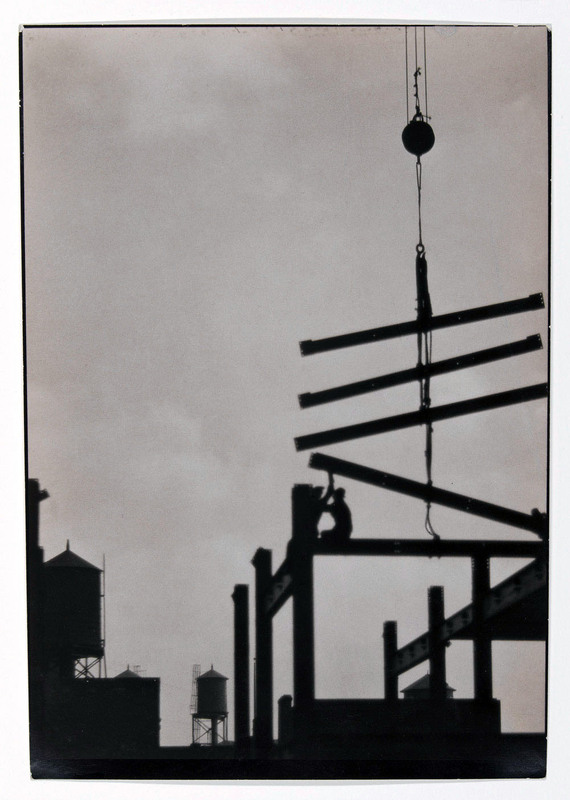 Thanks to a major gift from the Hall Family Foundation, the Nelson-Atkins now has the largest holding of Metzker’s work (92 prints) in the United States. 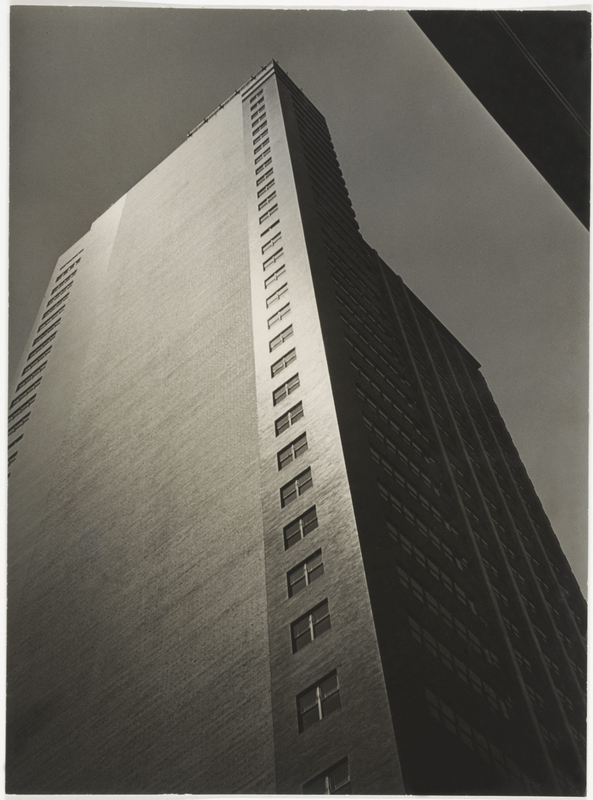 Born in Milwaukee, Wis., in 1931, Metzker first took up photography as a teenager. After two years in the army, he entered the graduate program at the Institute of Design, Chicago, in the fall of 1956. 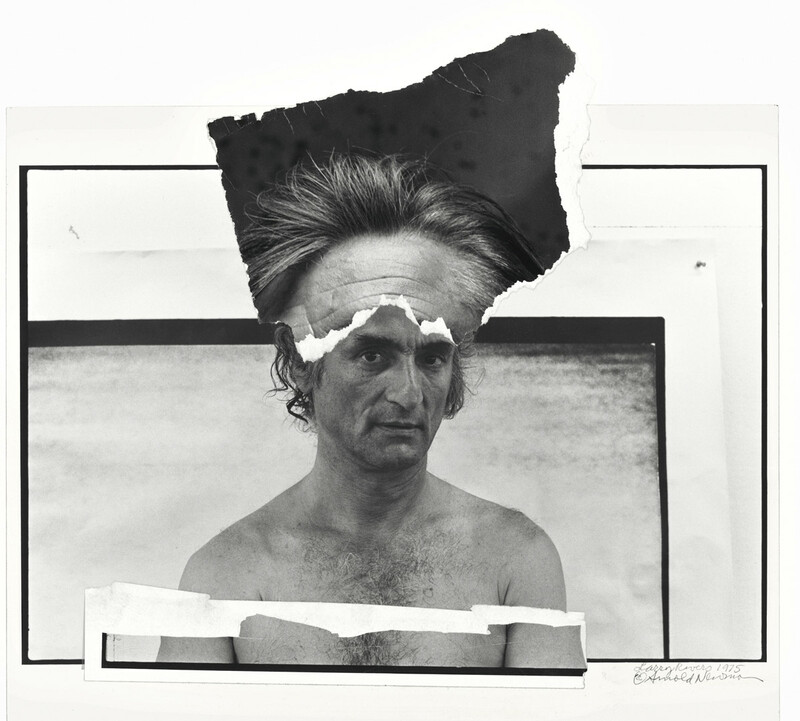 His professors, Aaron Siskind and Harry Callahan, were acclaimed artists and inspiring teachers, and they emphasized the medium’s remarkable range and visual potential. 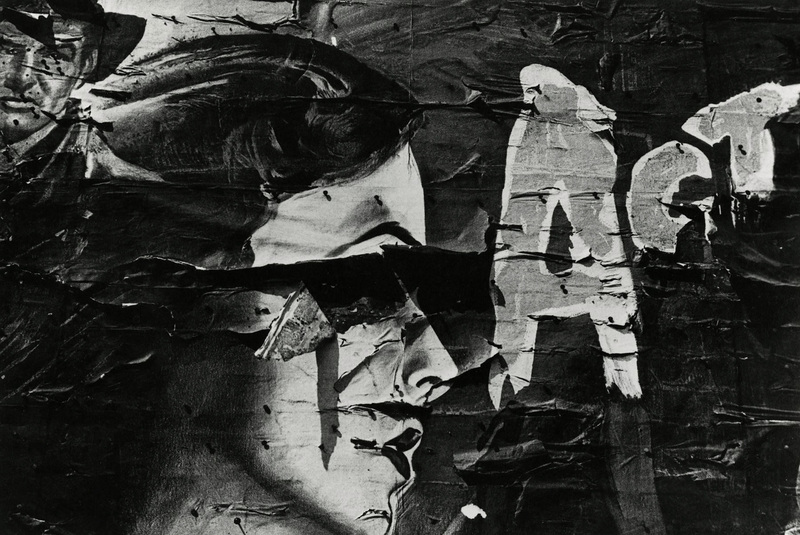 Metzker’s artistic vision grew from a union of ideas: the realities of modern life, the medium’s myriad technical possibilities, and the quest for a distinctly individual vision. 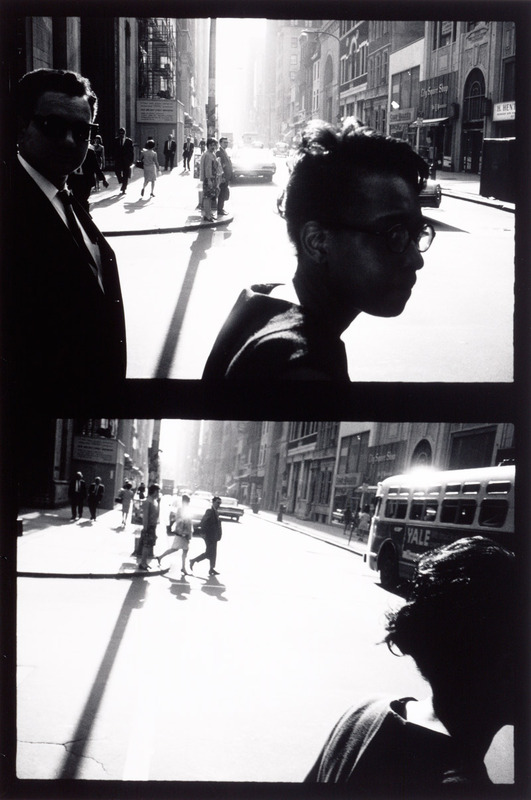 Metzker has lived and worked in Philadelphia since 1962, and as he approaches the age of 80, he continues to make new pictures there. The photographs in the exhibition feature examples from all his major series, including his earliest mature work from Chicago (1957-59); photographs from an extended visit to Europe (1960-61); the street activity, people, and structures of Philadelphia (from 1962 to the present); beachgoers at the New Jersey shore, Sand Creatures (1968-77); the starkness of the Southwestern light and landscape, New Mexico (1971-72); and the lush mysteries of the natural realm, in his Landscapes (1985-96) from Italy, France and the United States. Many thankx to Christophe Guye Galerie for allowing me to publish the photographs in the posting. Please click on the photographs for a larger version of the image. “The monstropolous beast had left his bed. Two hundred miles an hour wind had loosed his chains. He seized hold of his dikes and ran forward until he met the quarters; uprooted them like grass and rushed on after his supposed-to- be conquerors, rolling the dikes, rolling the houses, rolling the people in the houses along with other timbers. The sea was walking the earth with a heavy heel. Christophe Guye Galerie is pleased to present The Monstropolous Beast, Will Steacy’s (*1980, American) first solo exhibition outside the United States. For his first solo exhibition at the Christophe Guye Galerie, Will Steacy is showing a cross-section of his past years of creative working. 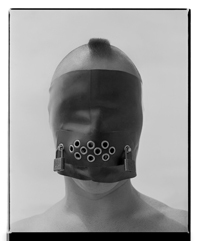 Showing 28 new and recent photographs, The Monstropolous Beast is the first exhibition to comprehensively portray Steacy’s whole body of work to date. 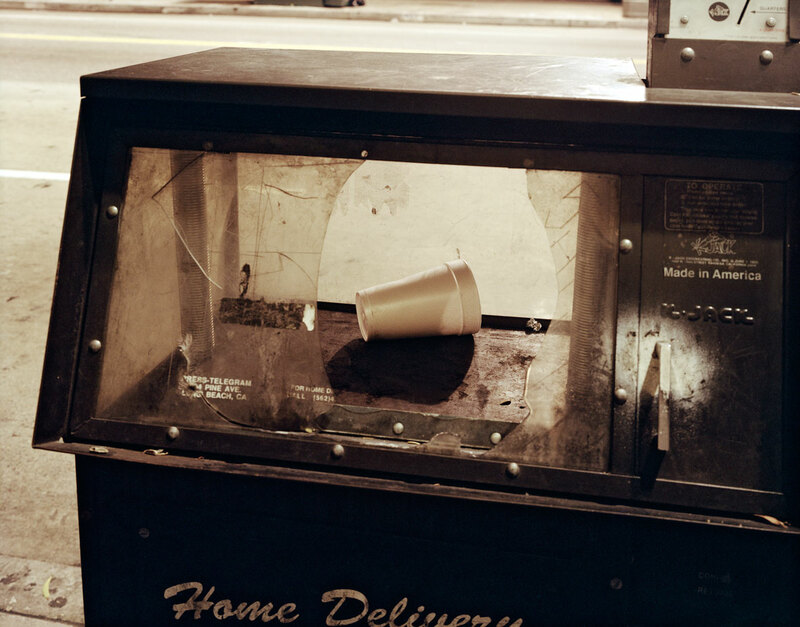 Once named “the lovechild of Charles Bukowski and Dorothea Lange” Steacy’s work is poetic and confrontational alike, at once evoking photojournalist documentation and romanticised realism. Steacy’s imaginary stems from his experiences, encounters and the desire to awaken. His work quietly observes, holding on to moments of apparent silence that would pass unnoticed had he not been there to click the shutter. Breathtaking and touching, the emotional force of the artist’s work allows the viewer to intimately connect with the subject. Deeply philosophical, the camera permits him to ask questions, to truly see and think. It is for Steacy a tool with which to understand the world; an understanding he wants to convey to his viewers. His method of inquiry is a large format film camera. 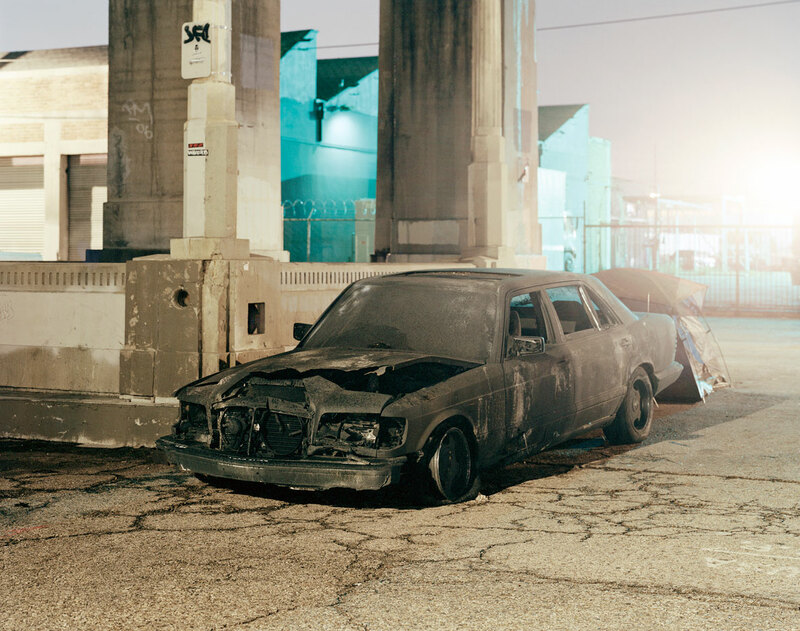 Photographing the depleted city centres and rural suburbs of America, Steacy has spent the last years travelling his country to create a body of work that through its social connotations goes beyond simple photography. 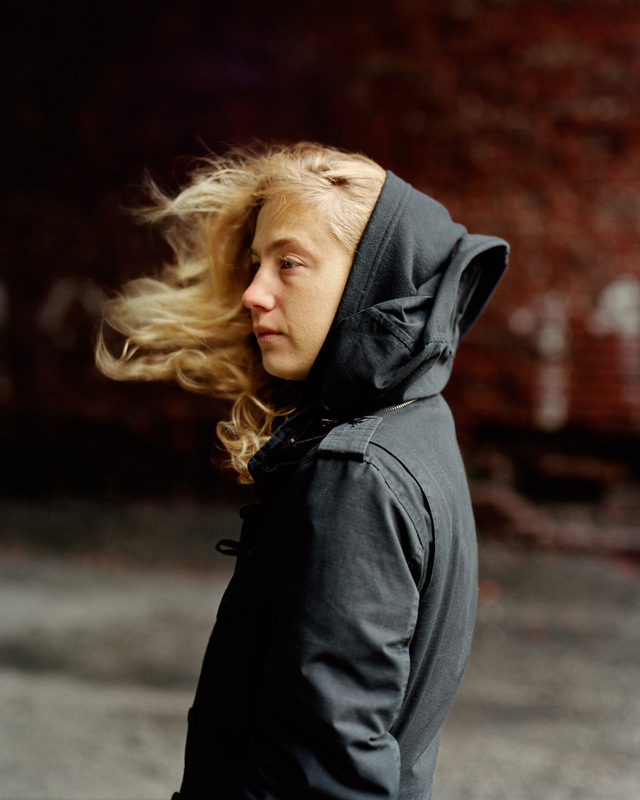 As a former Union Labourer, one can sense the humanistic approach to Steacy’s art. While deeply personal, Steacy works with the intention to create awareness, challenging people to look inward. 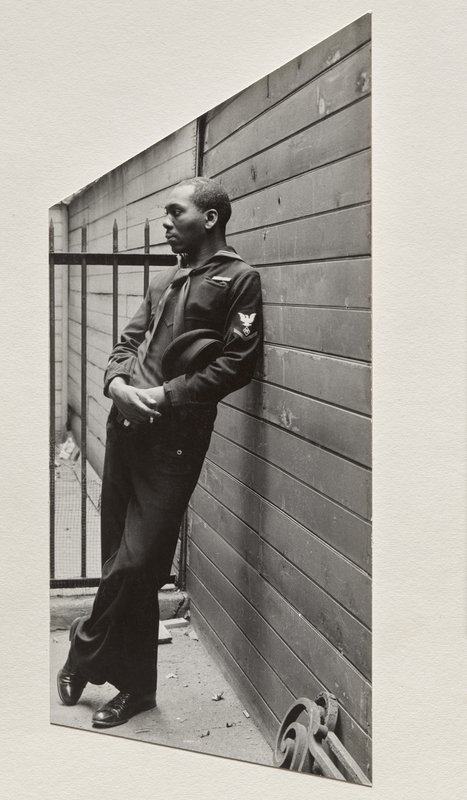 A key series in the exhibition is Down These Mean Streets, for which the artist examined fear and abandonment of America’s inner cities. 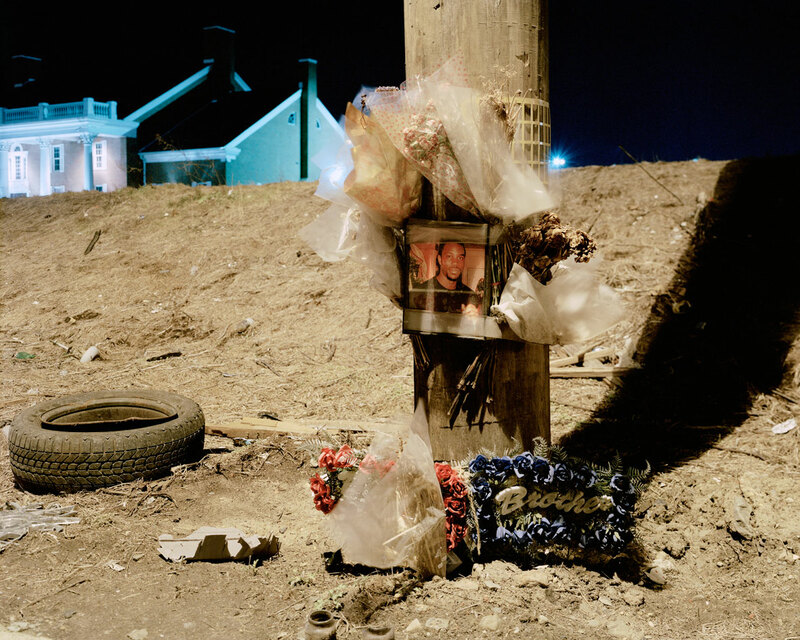 The reality experienced at night on the streets is so haunting it becomes a hyper reality; laden with emotional and mental attachment, in works such as Memorial or Home Delivery the energy and courage that spark the artist’s work is intensely apparent. 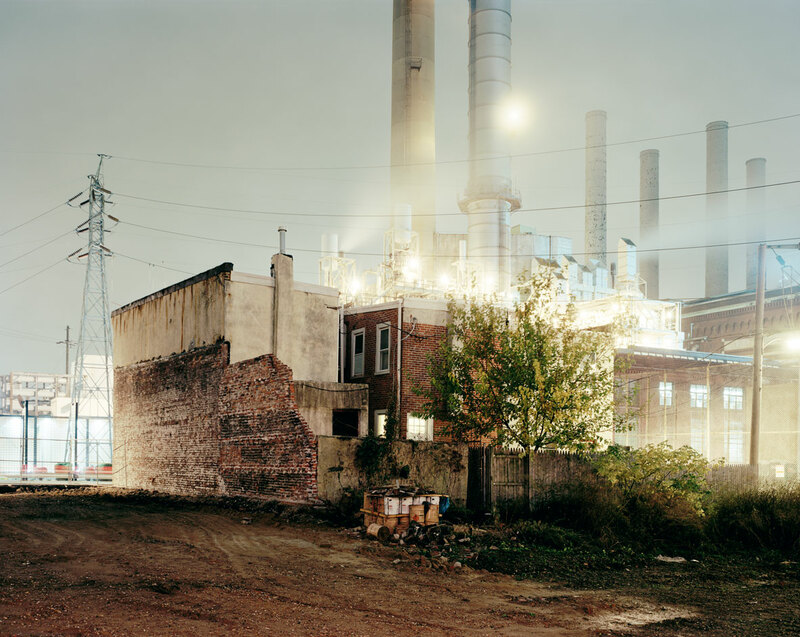 Factories, deserted streets and inhabitants of neglected neighbourhoods are his subjects. 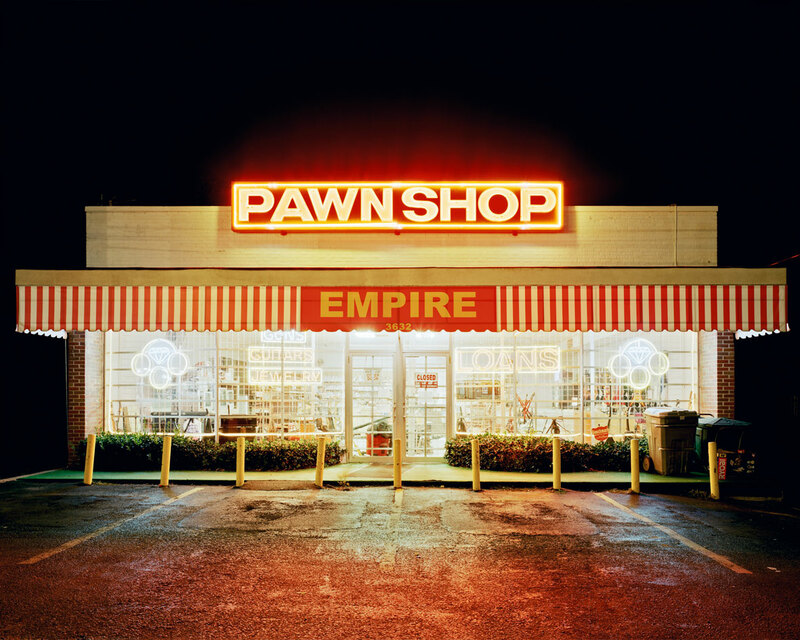 By addressing the loss and despair that reign in US metropolitan communities, his aim is to reveal a modern day portrait of the reality in American urban centres. 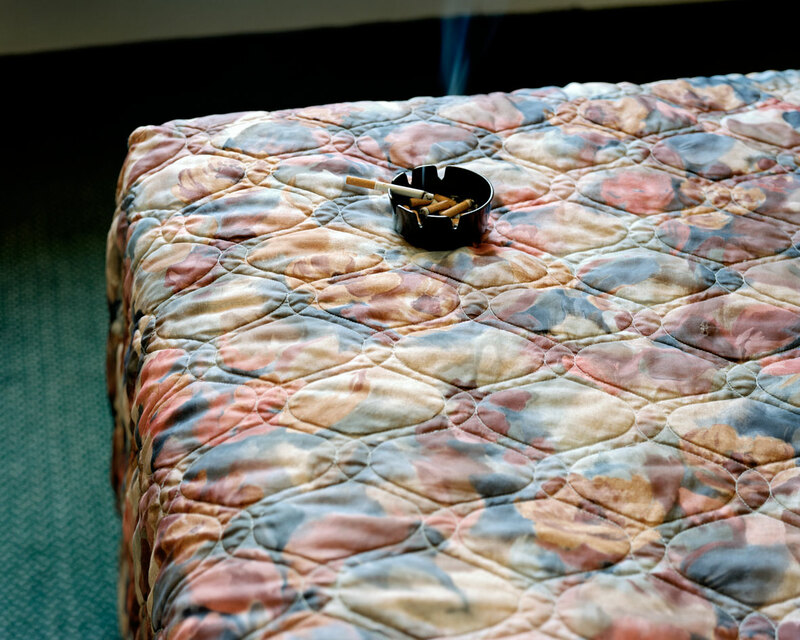 Though still early in his career, the almost ordinary or unspectacular subject matters depicted in the works shown bring to mind the works of William Eggleston or Martin Parr. Demonstrating a distinctive ability to find beauty or fascination in commonplace scenes, and illustrating them with vivid displays of colour and luminosity, Steacy’s works take a critical look at modern society and human conditions, bring viewers uncomfortably close to an often sombre reality. Monday – Friday 11 a.m. to 7 p.m.
Saturday 12 a.m. to 6 p.m.